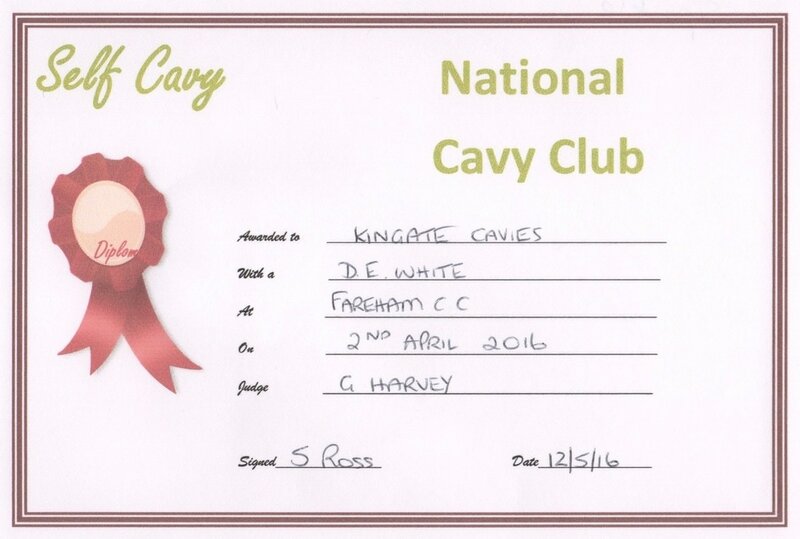 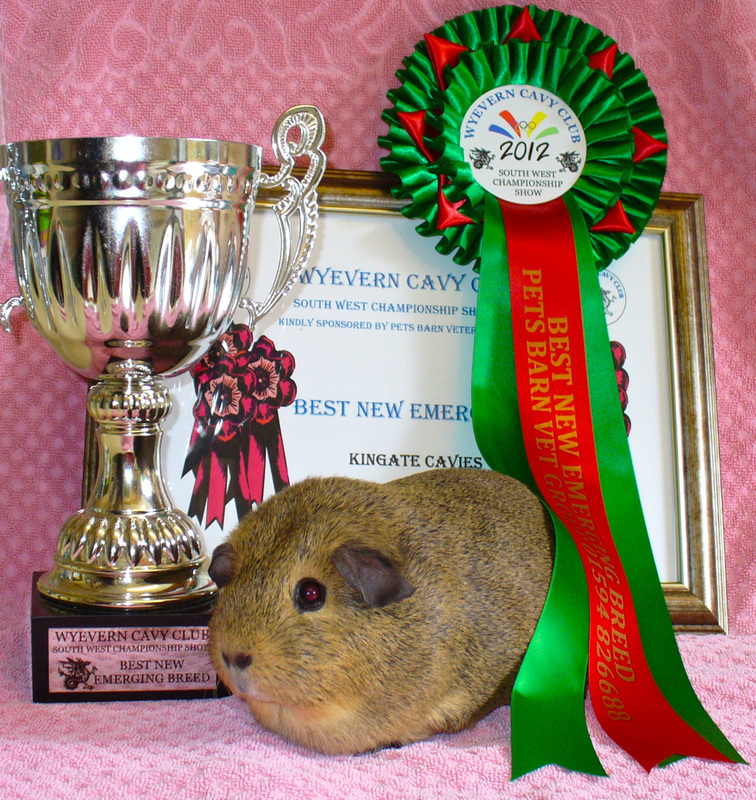 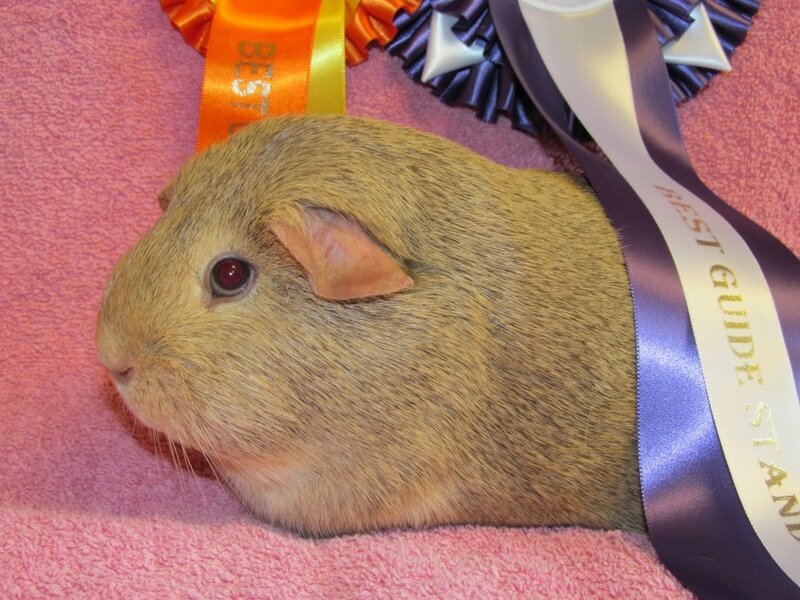 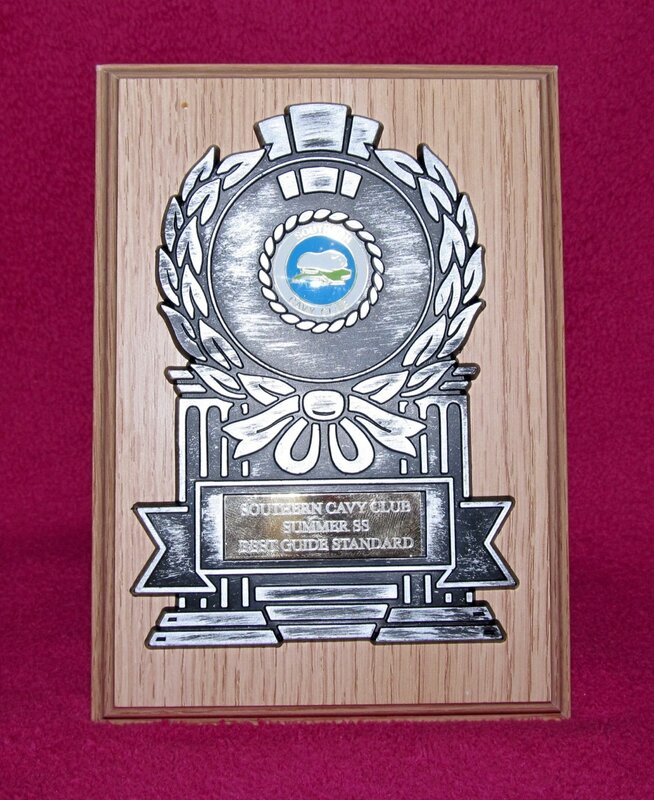 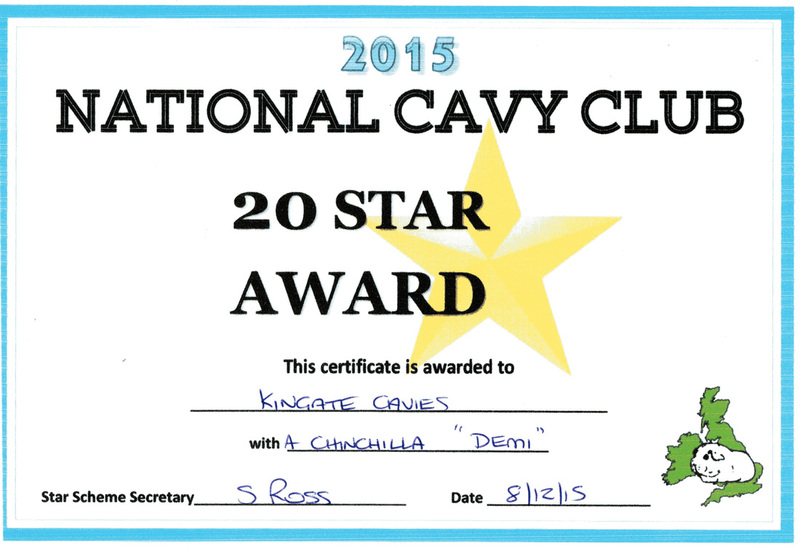 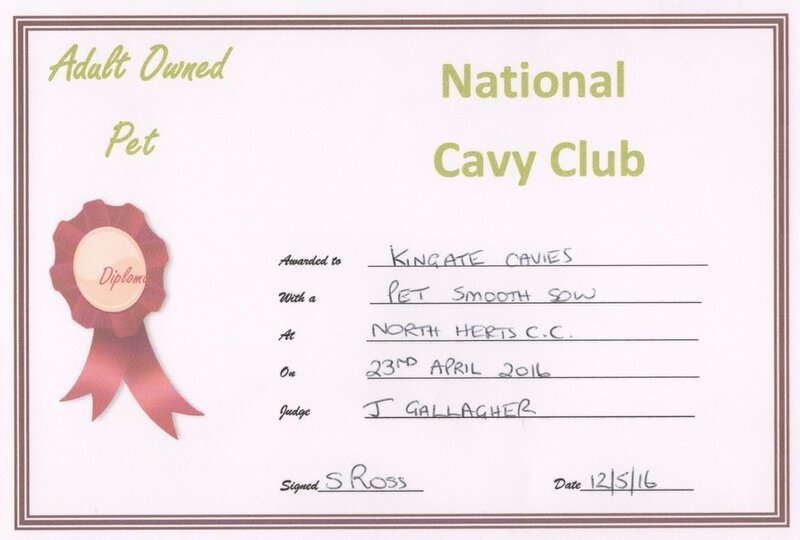 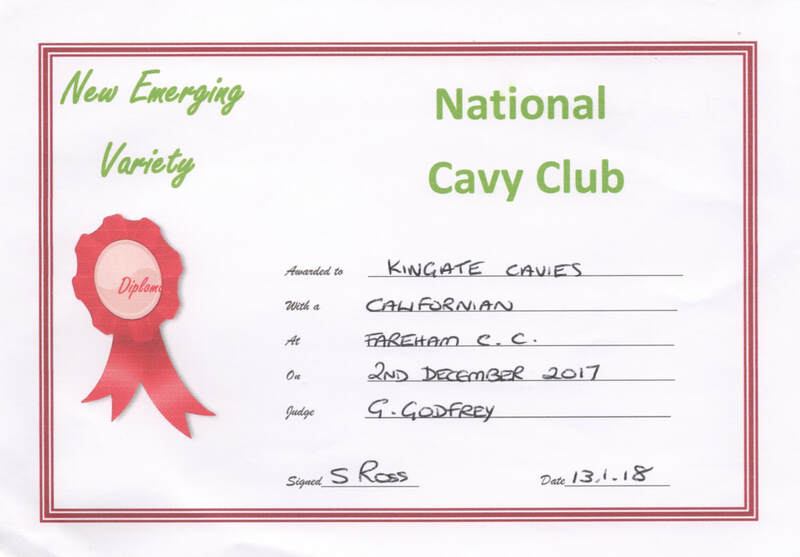 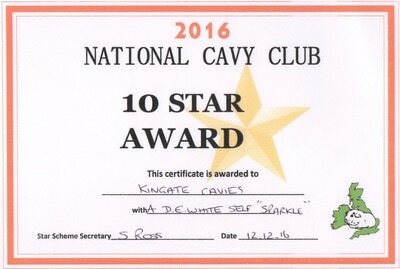 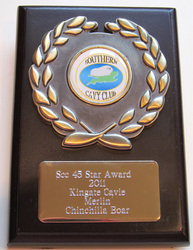 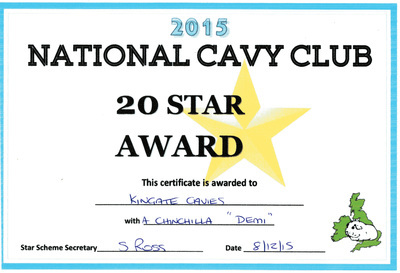 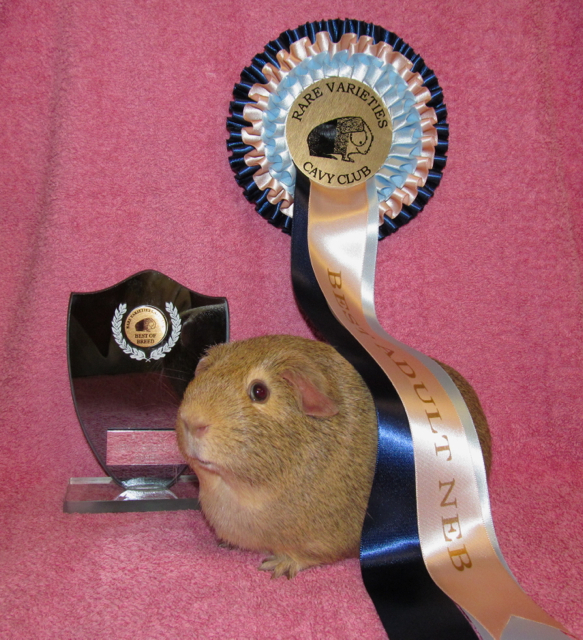 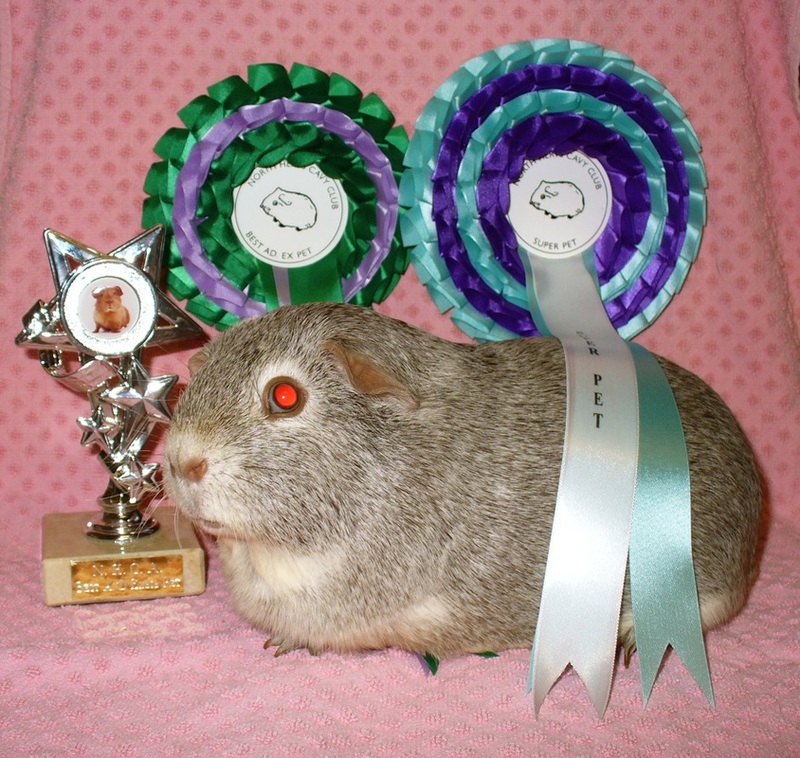 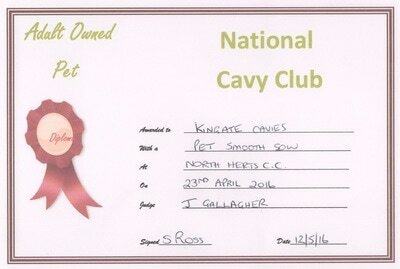 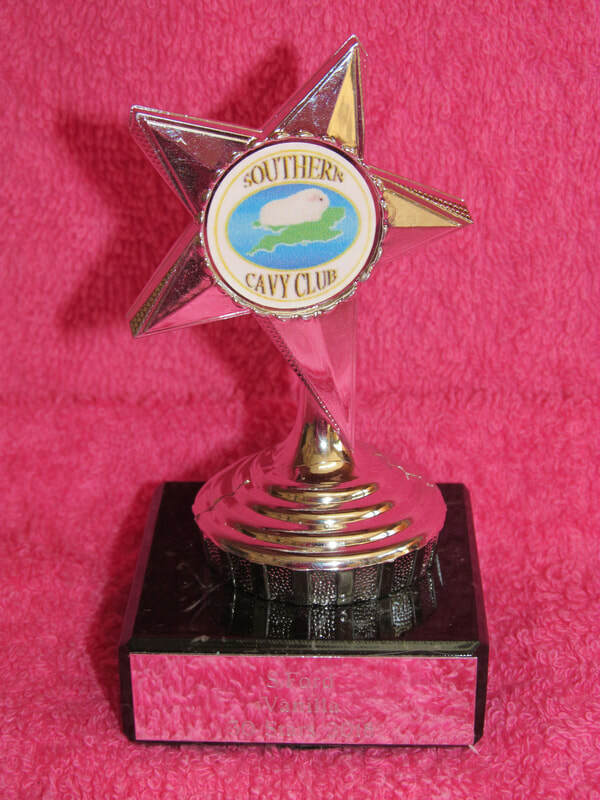 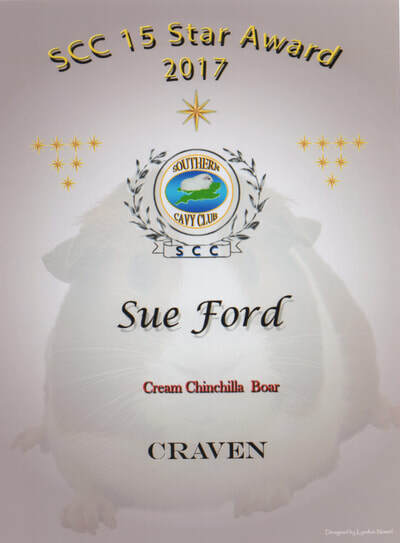 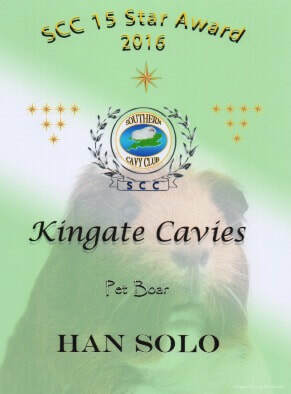 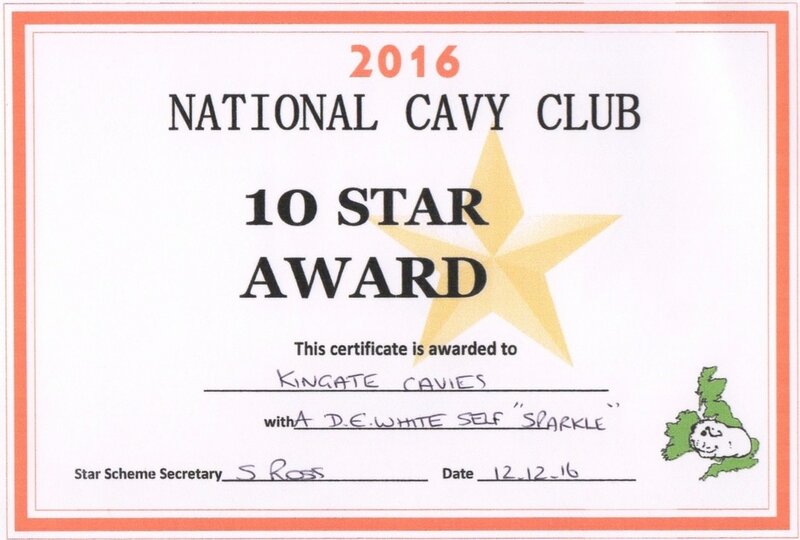 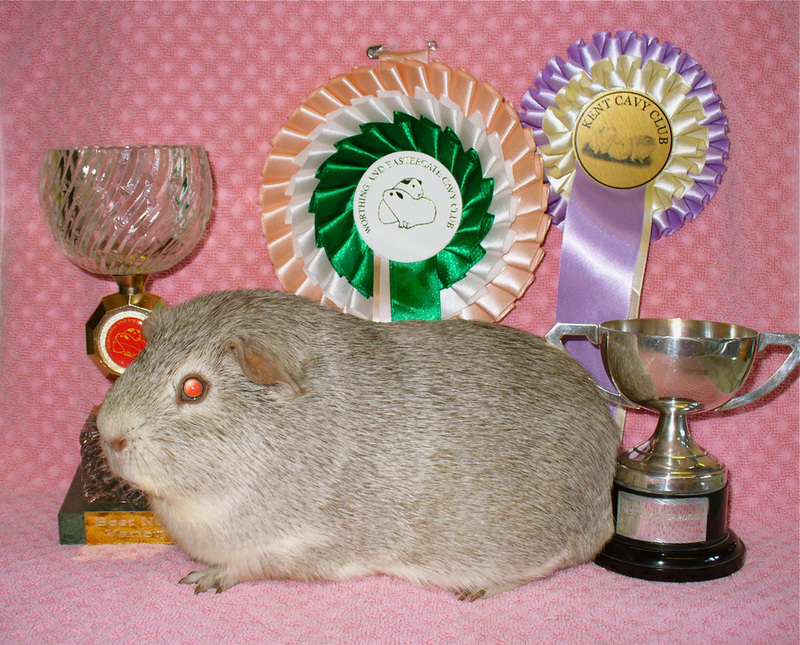 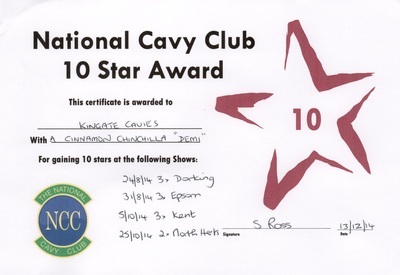 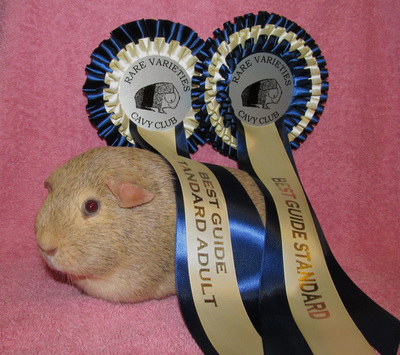 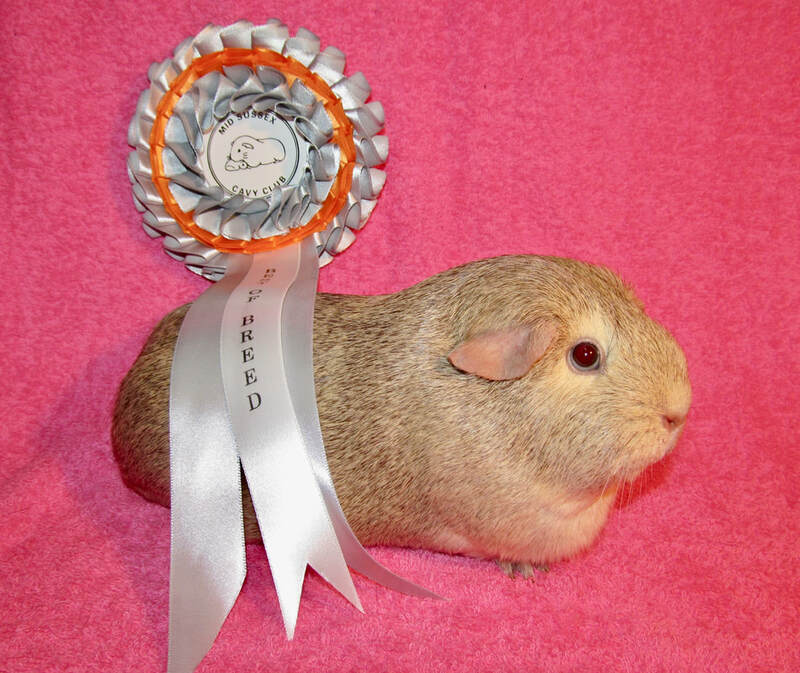 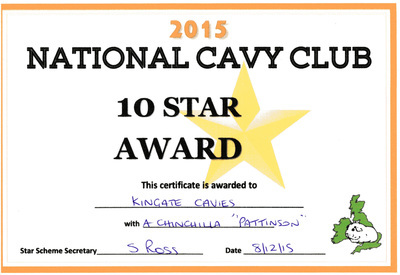 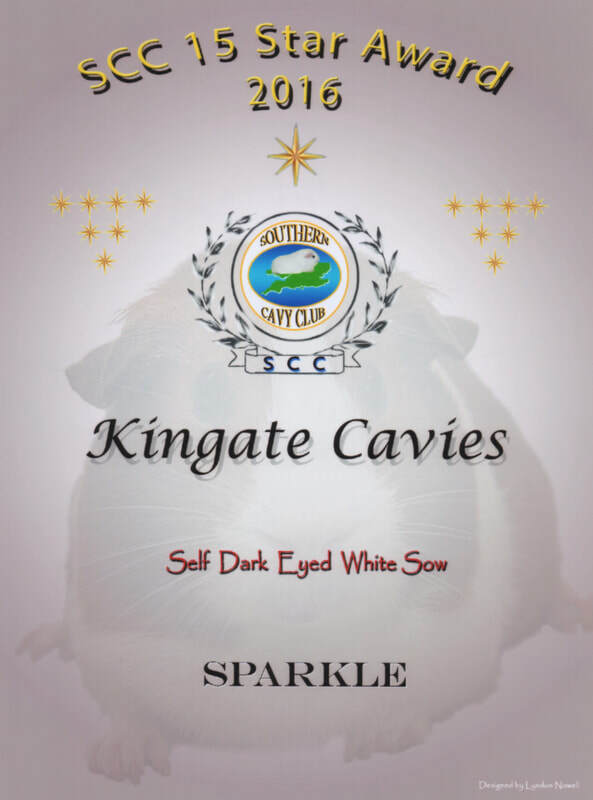 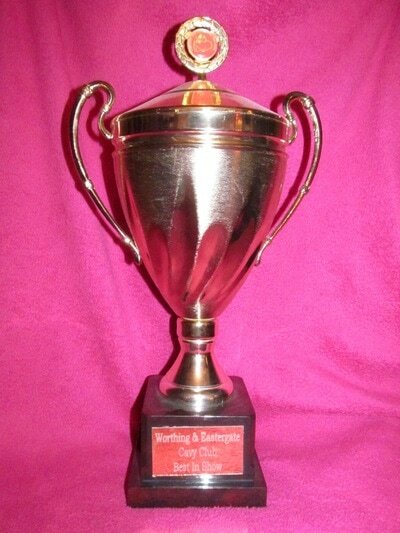 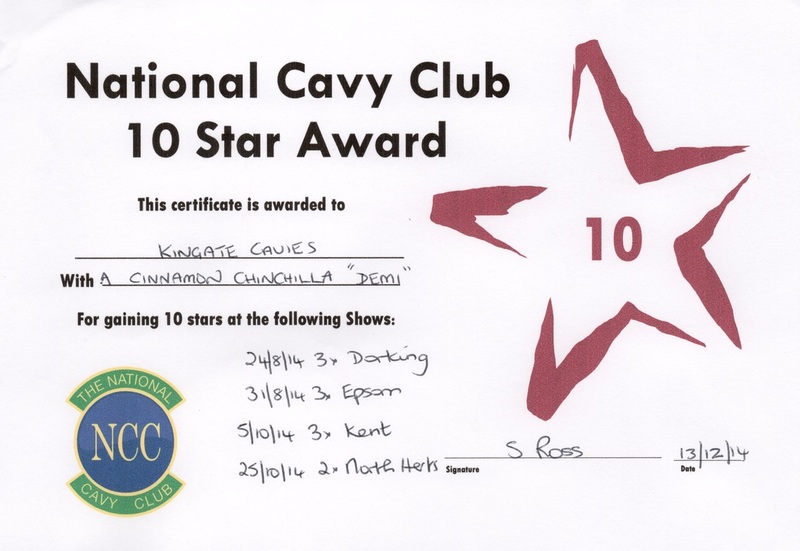 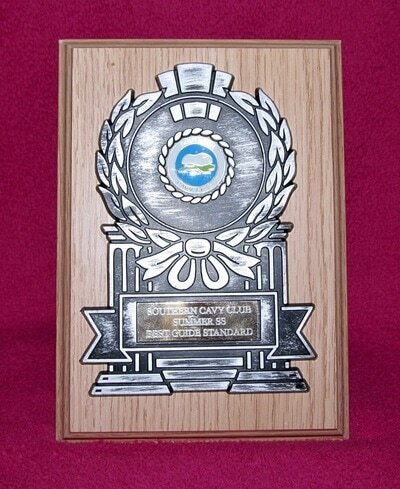 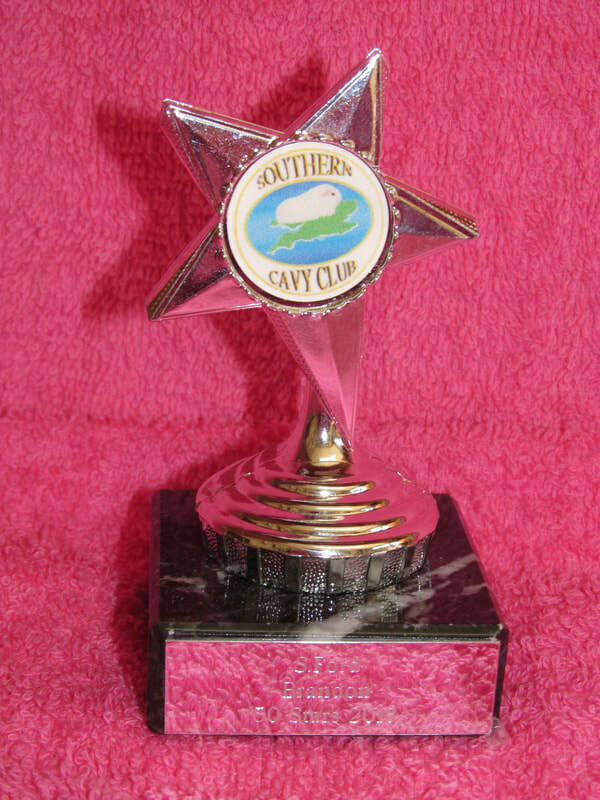 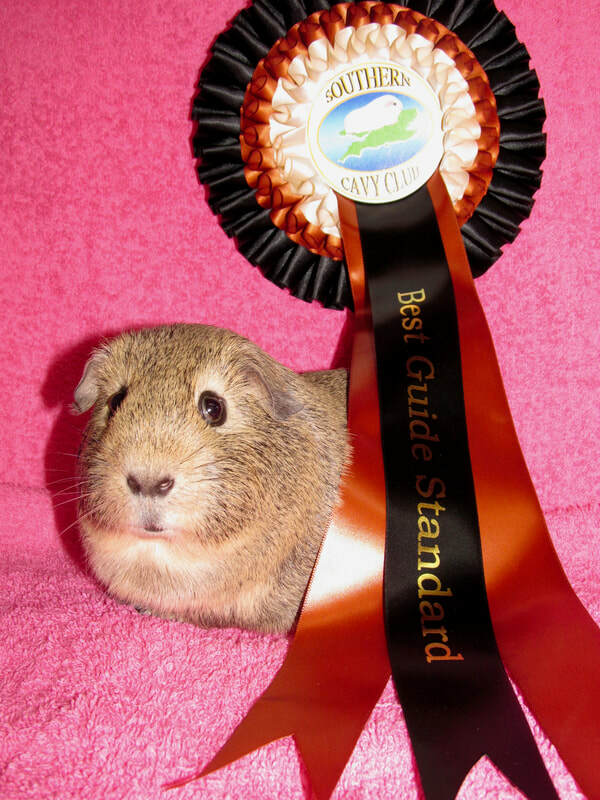 I won a trophy from the National Cavy Club for collecting the most New & Emerging Breed Diplomas for 2014. 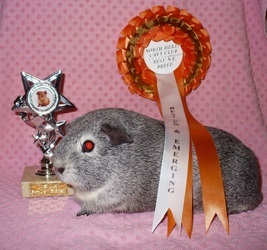 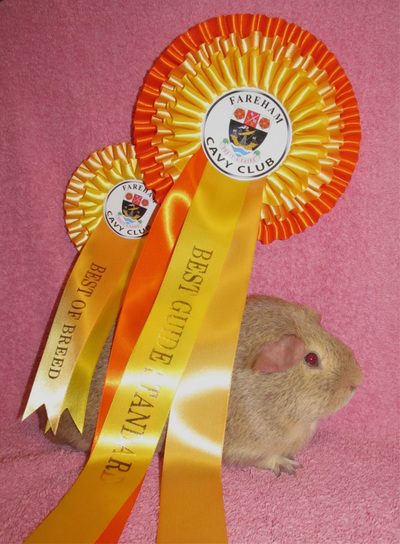 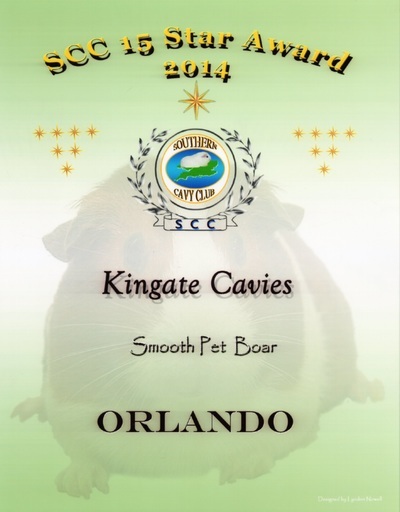 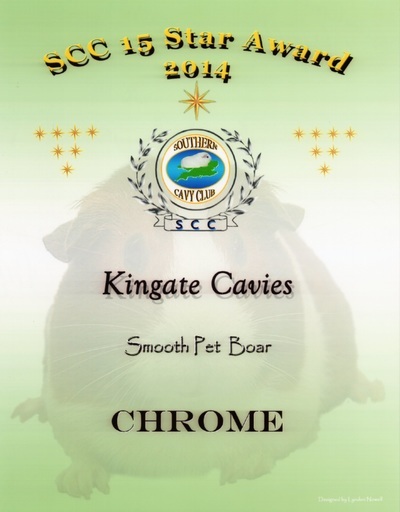 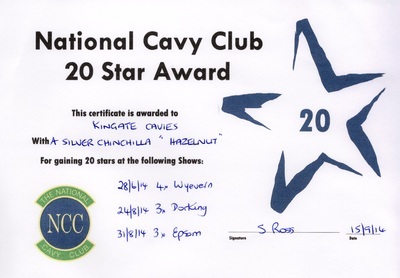 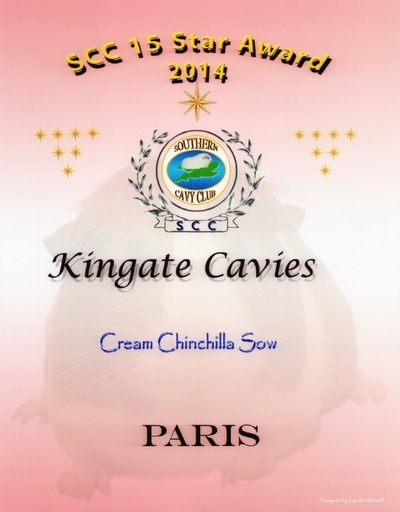 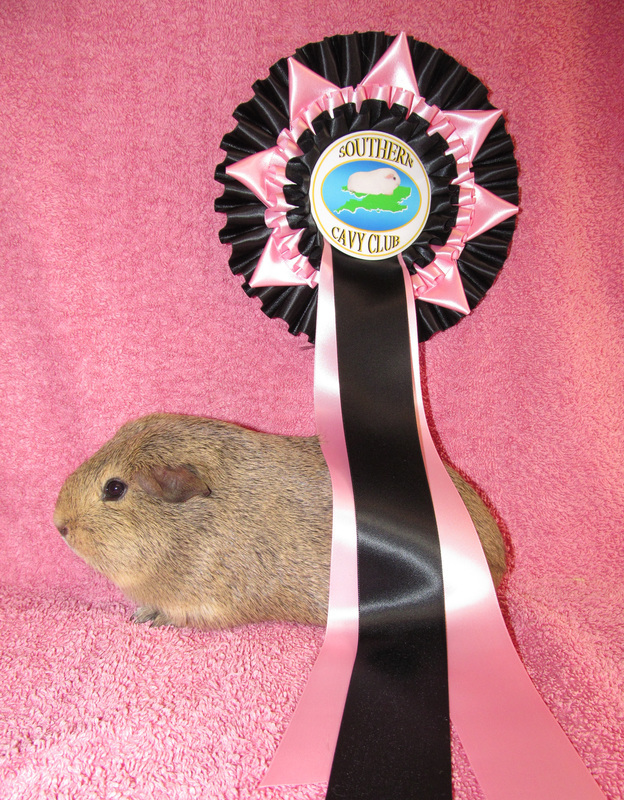 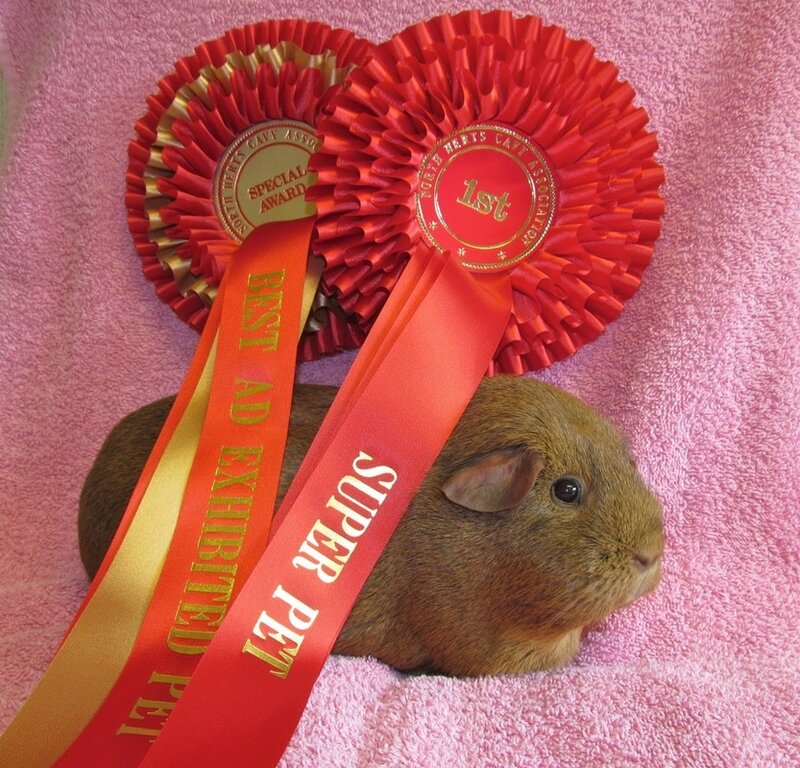 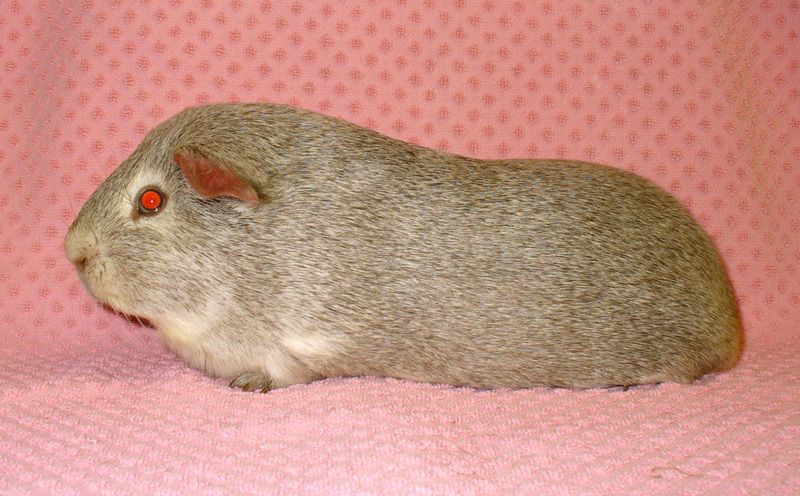 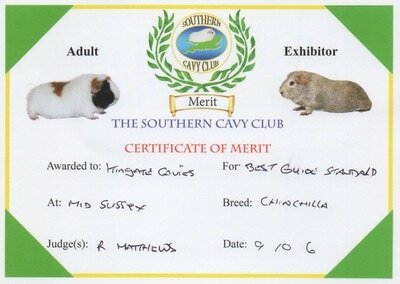 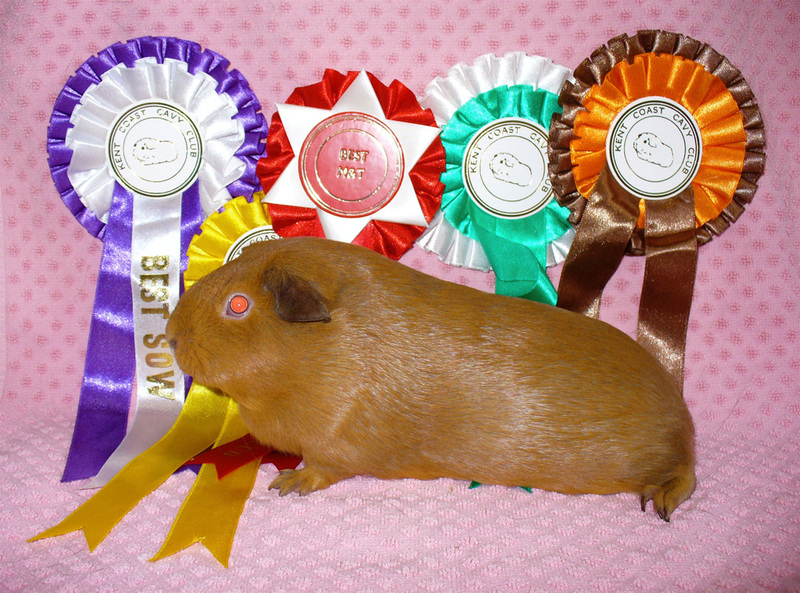 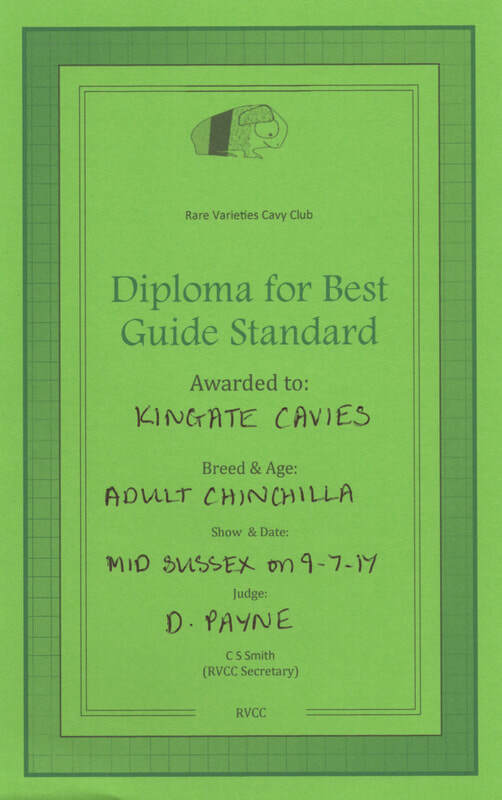 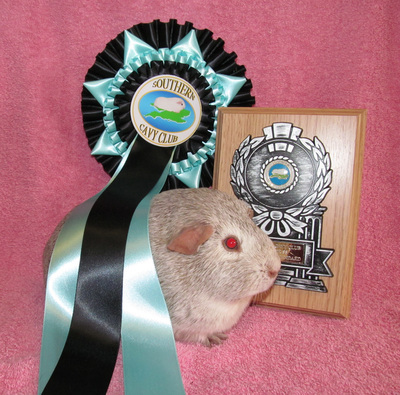 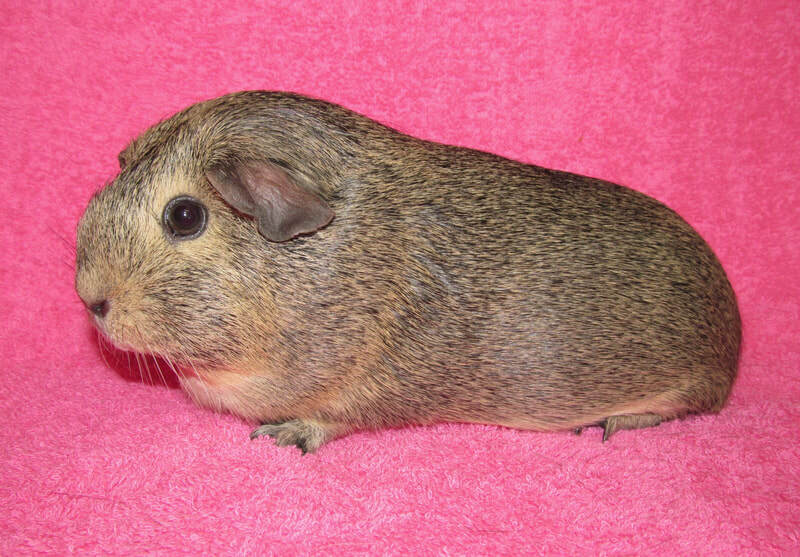 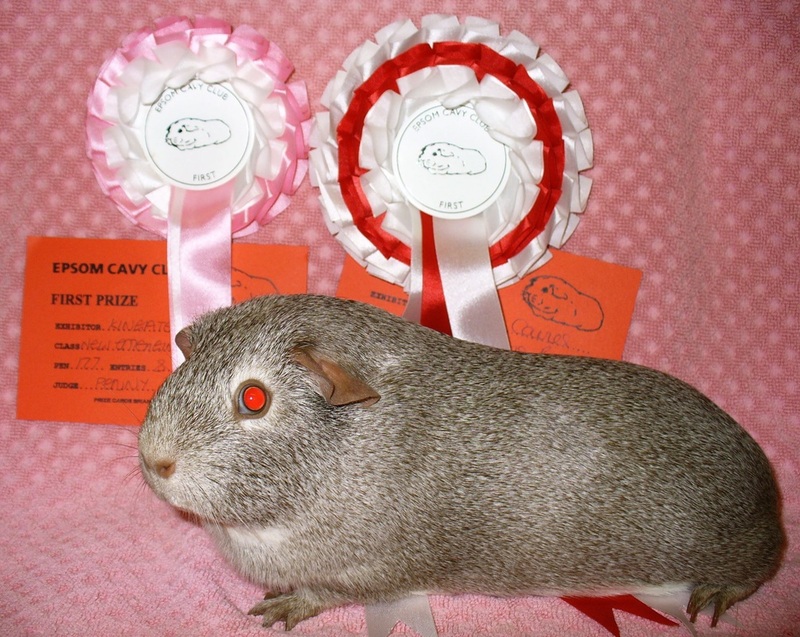 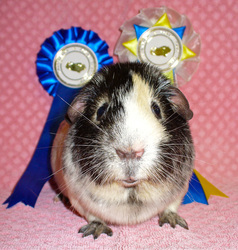 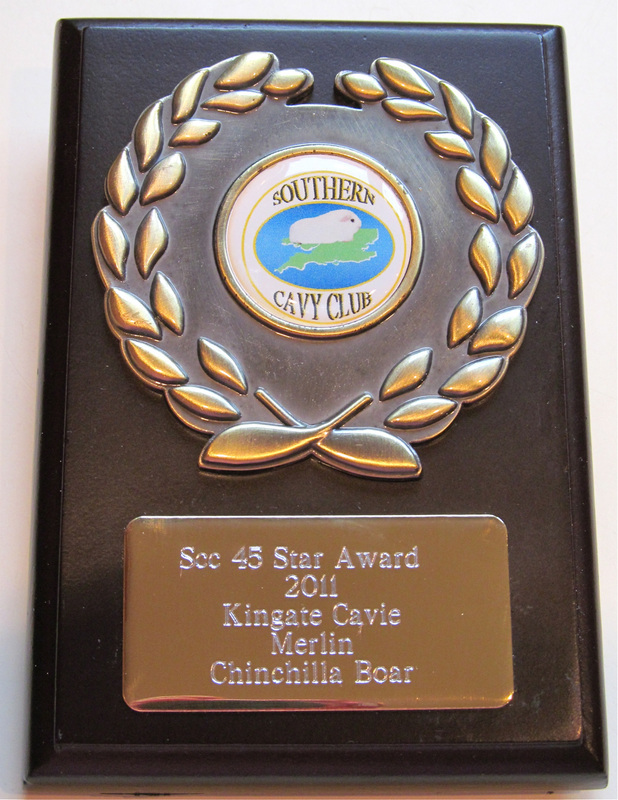 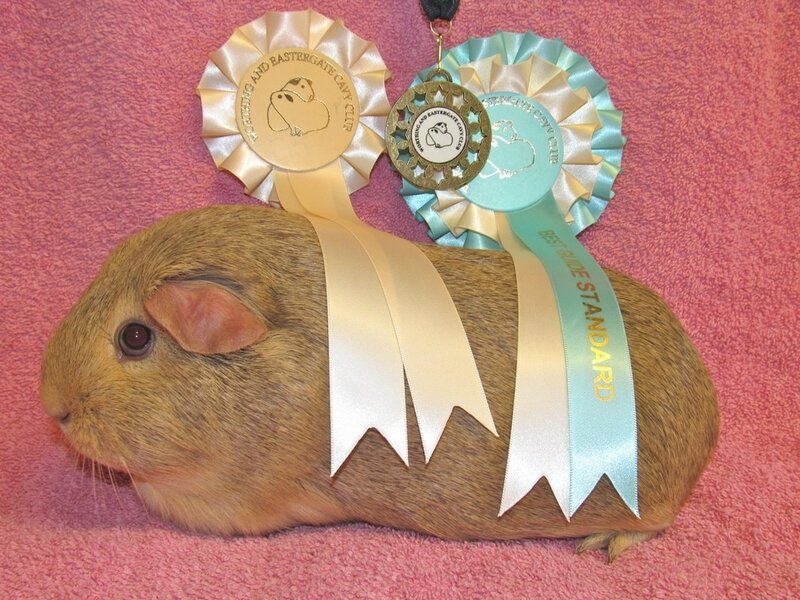 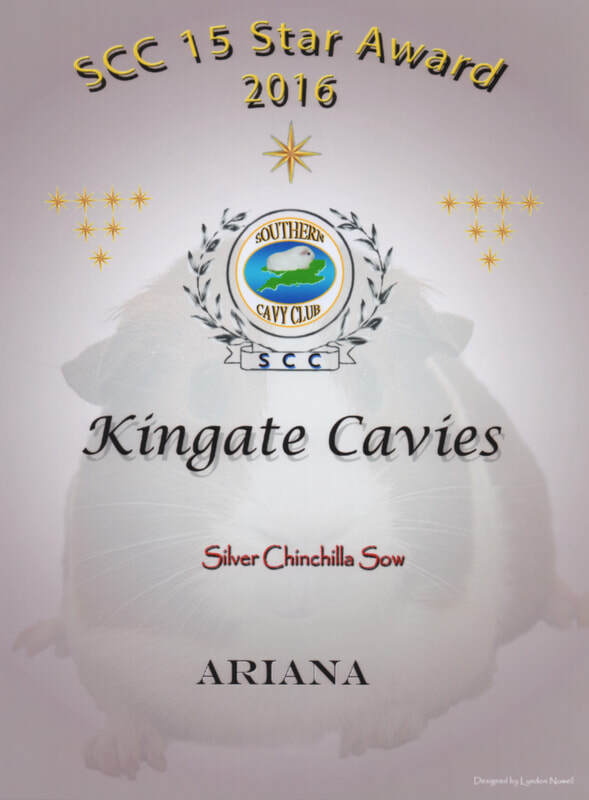 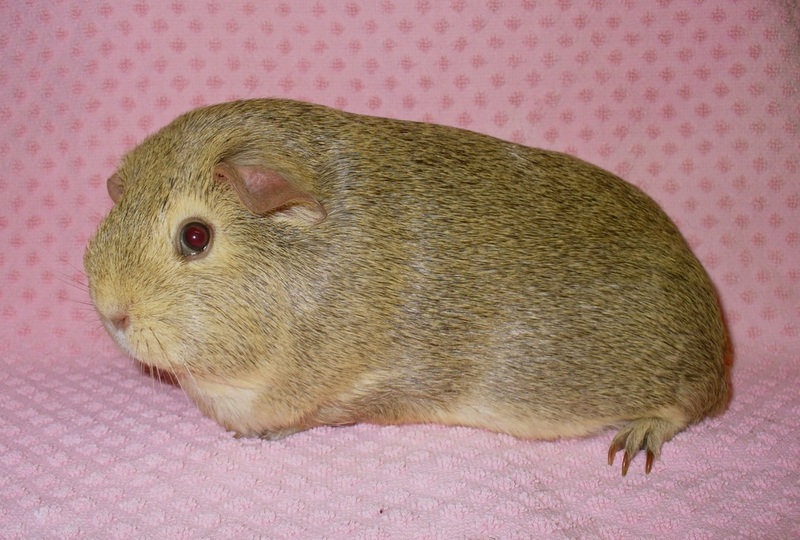 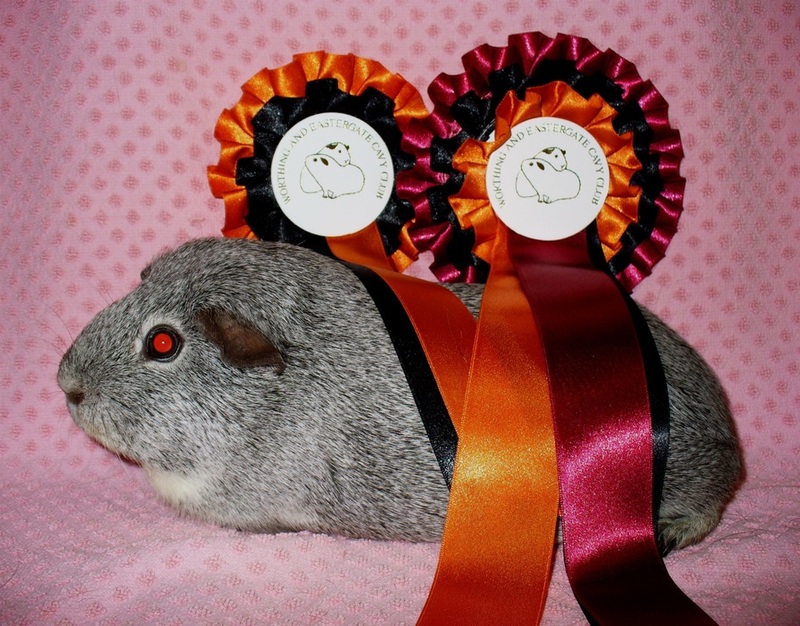 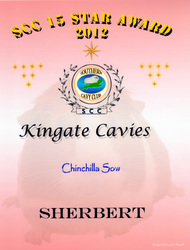 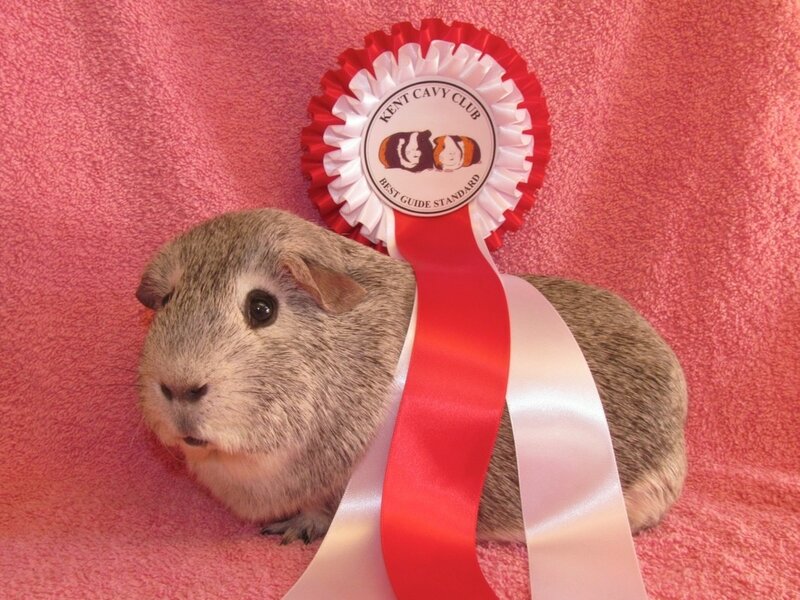 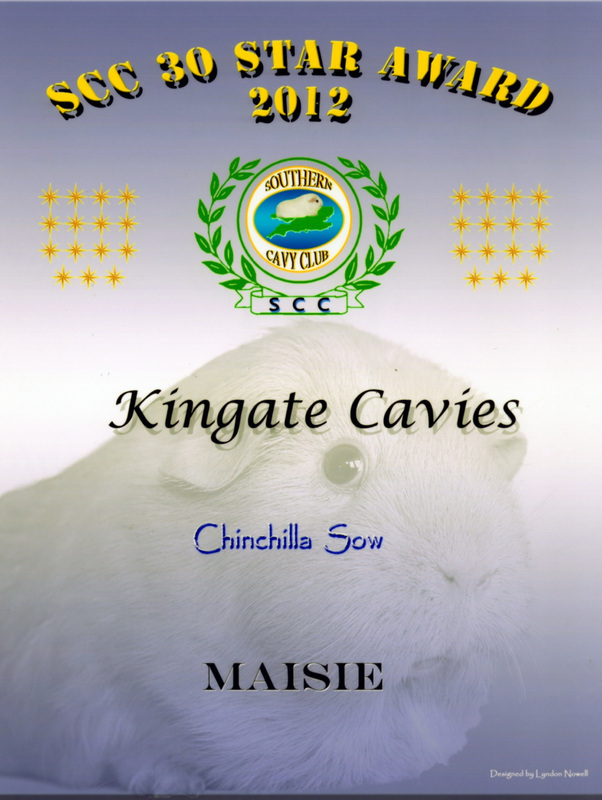 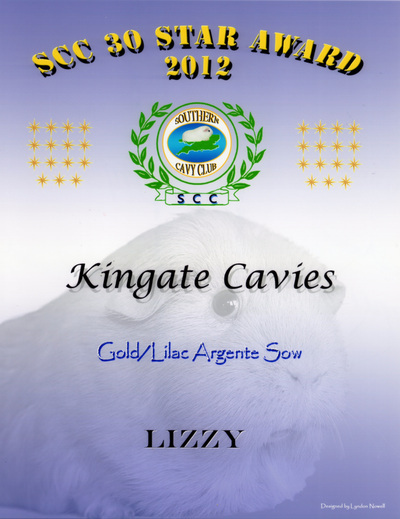 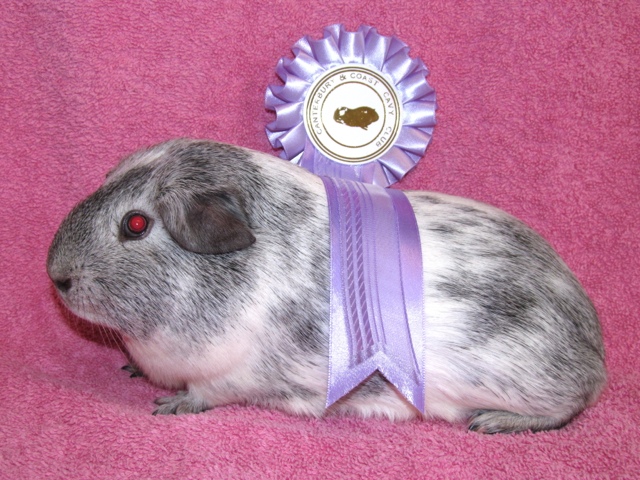 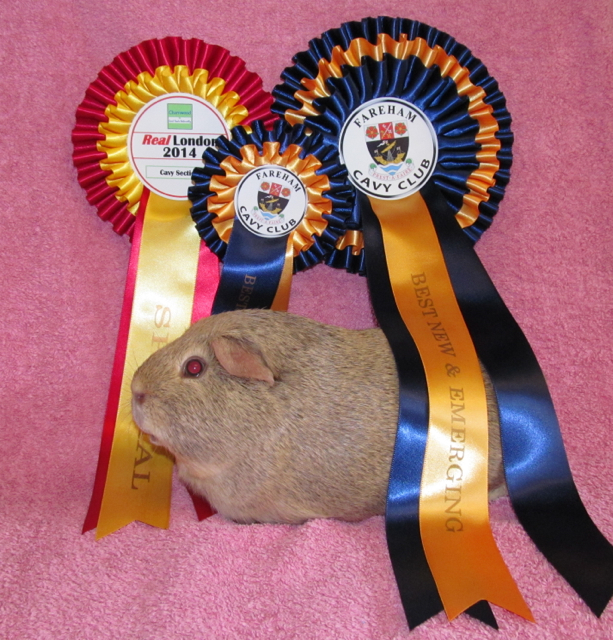 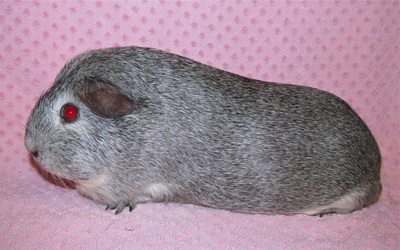 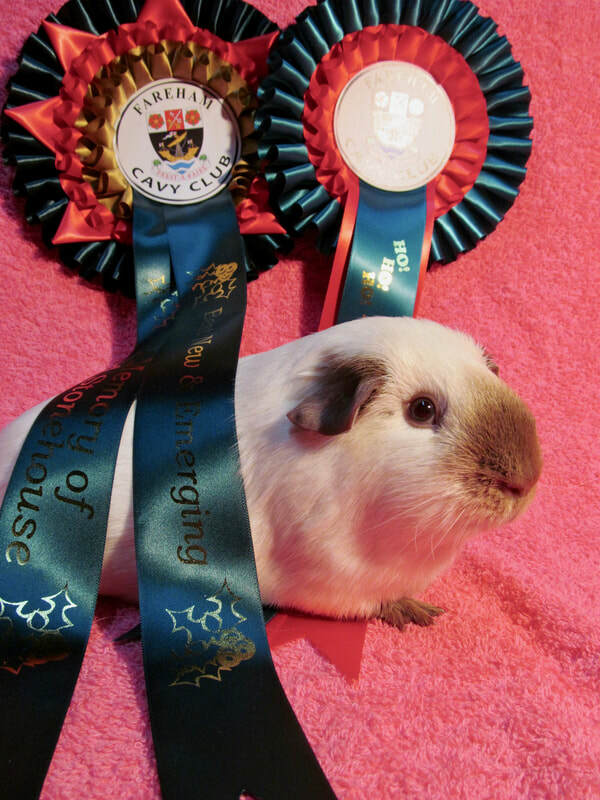 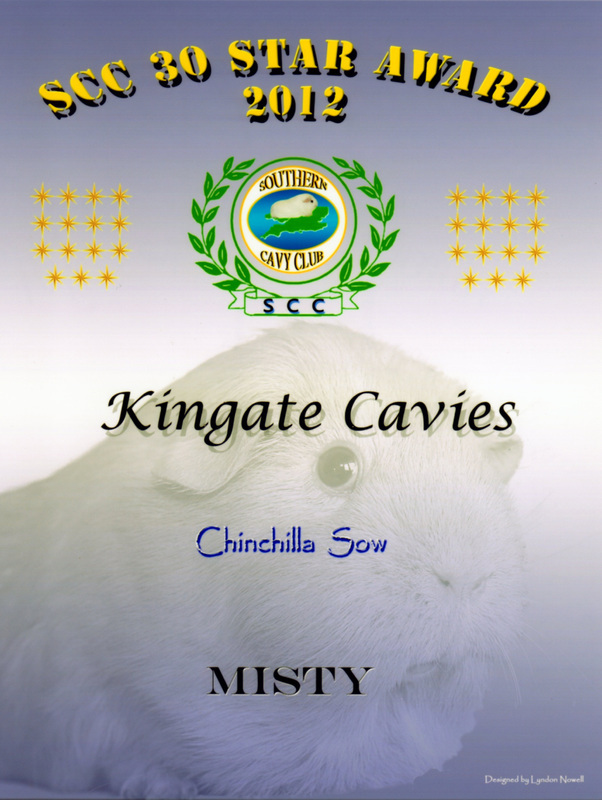 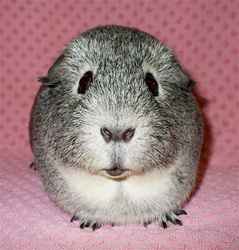 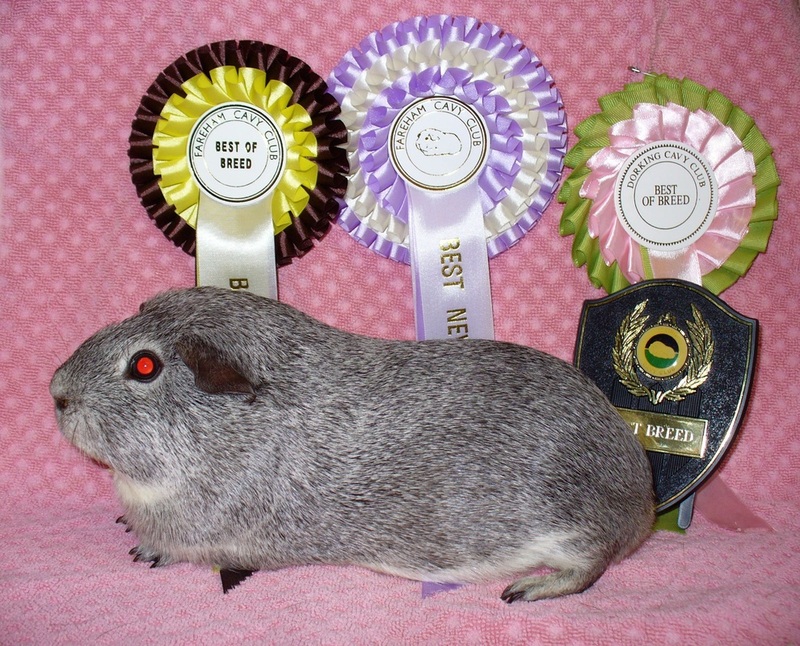 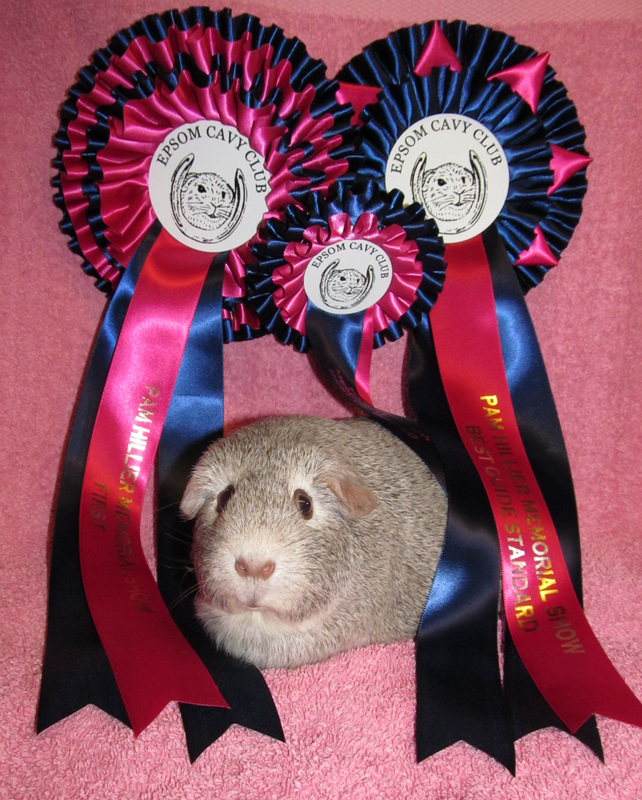 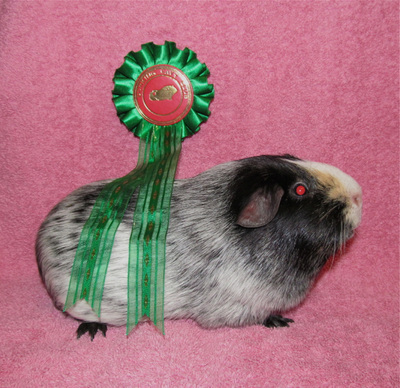 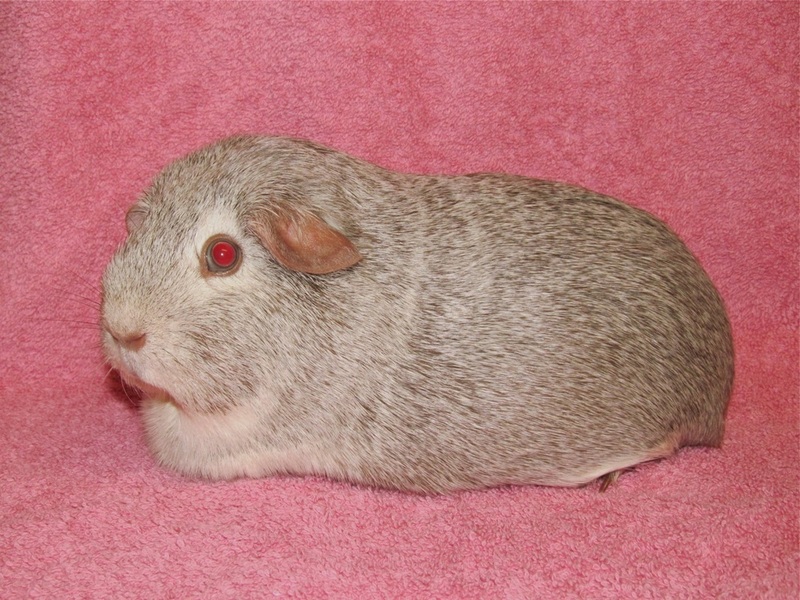 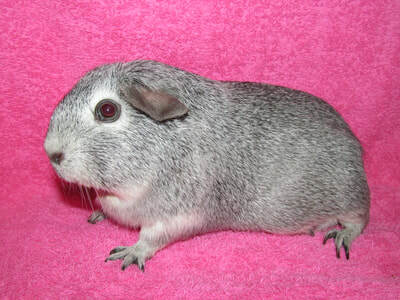 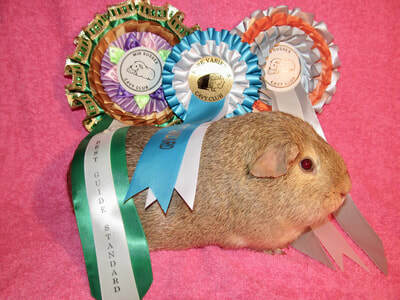 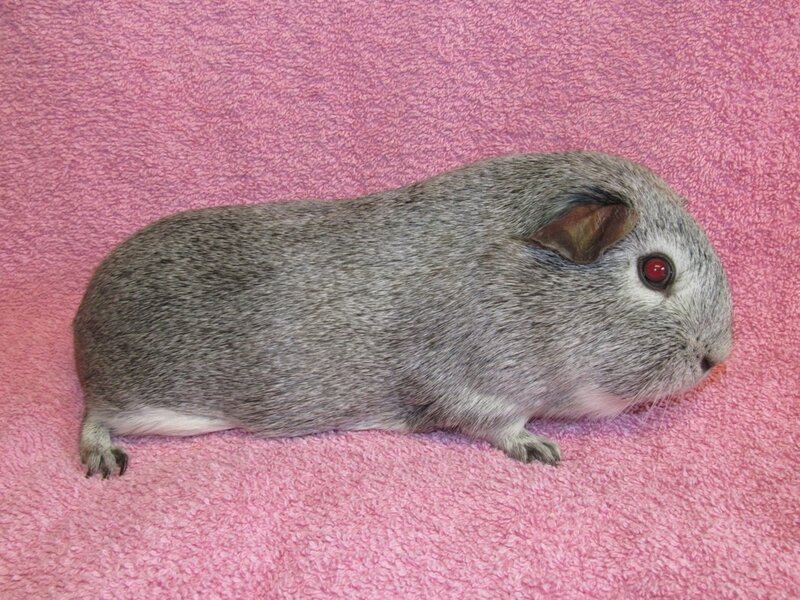 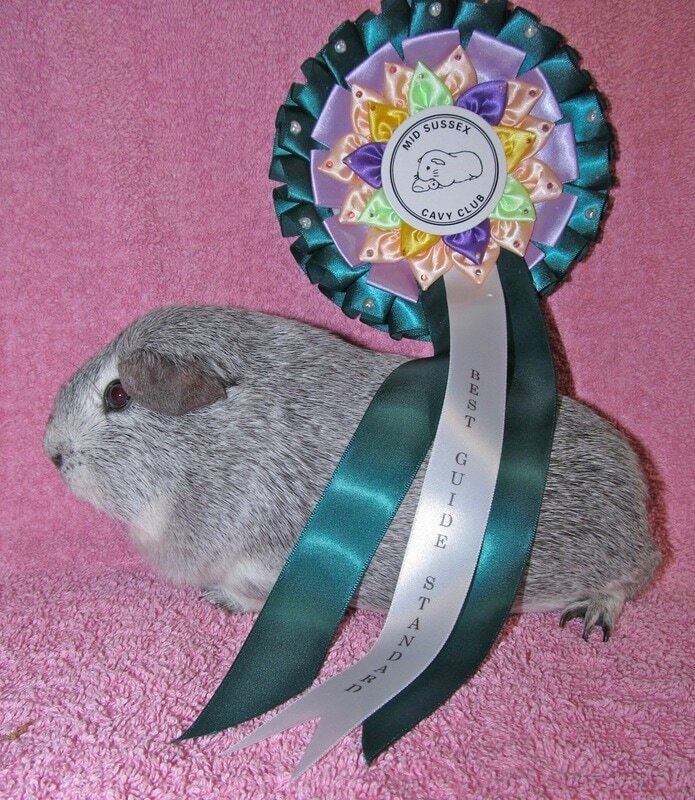 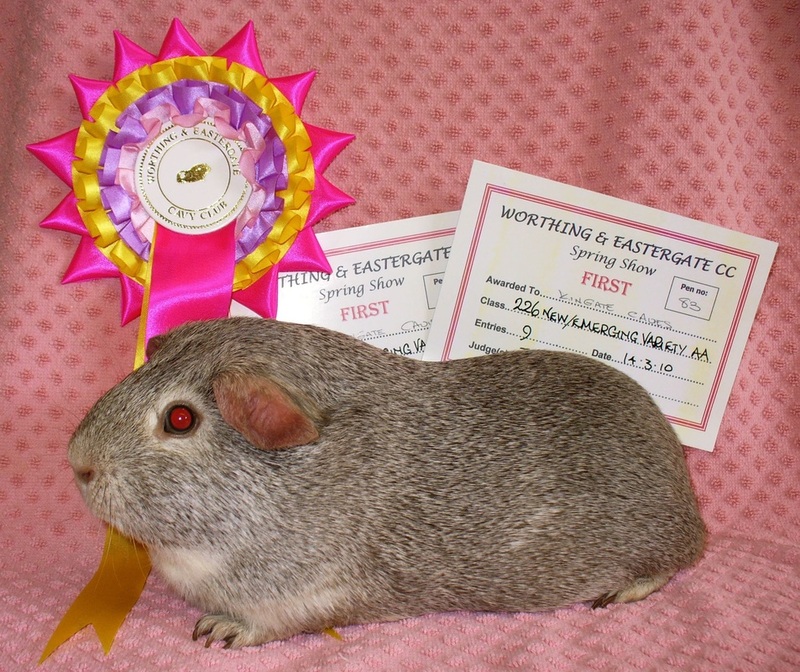 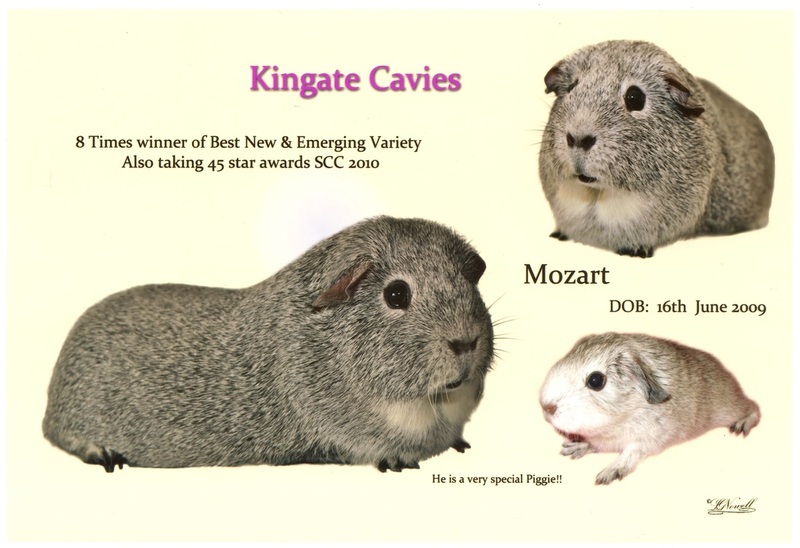 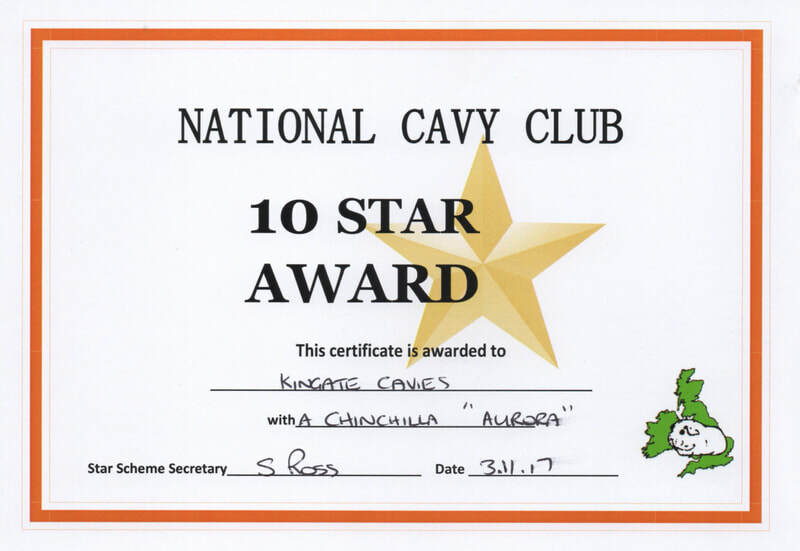 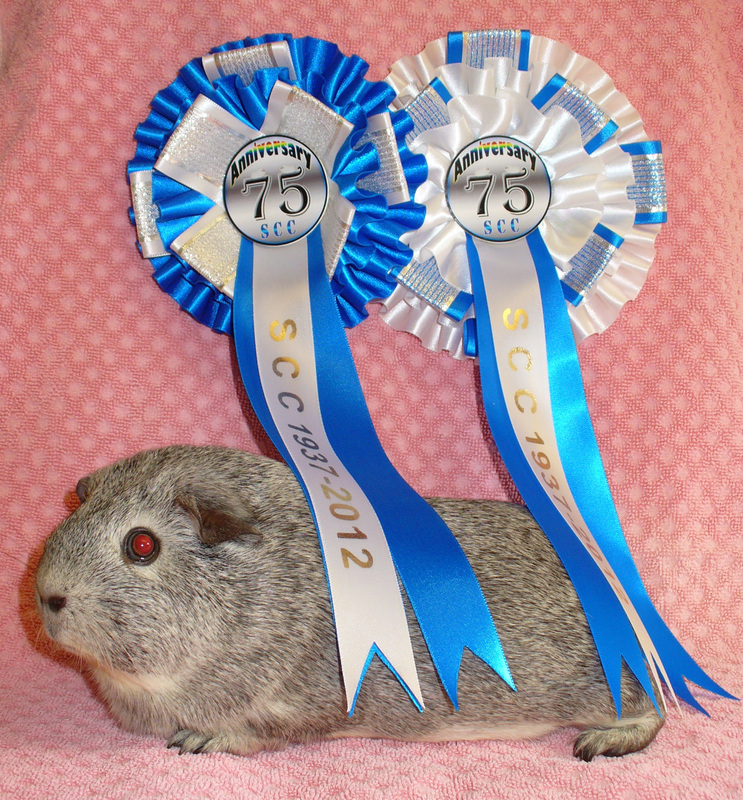 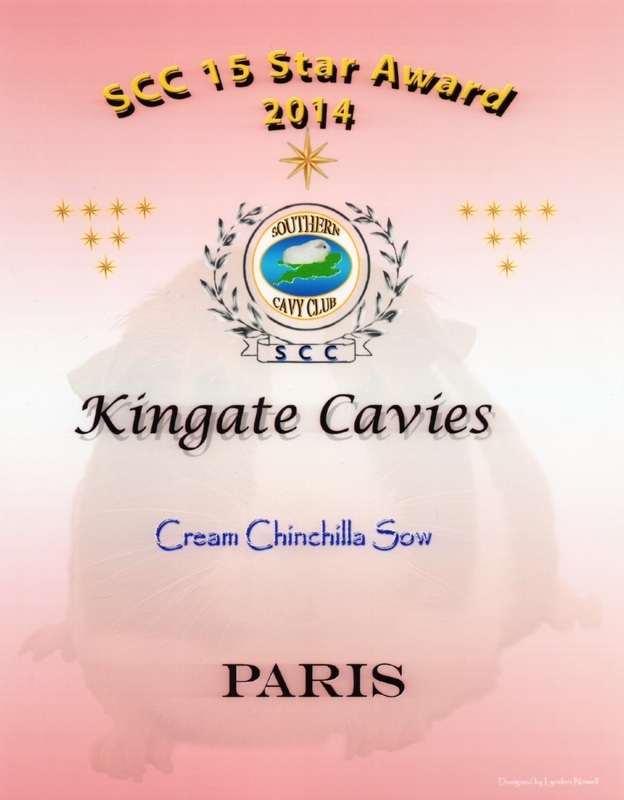 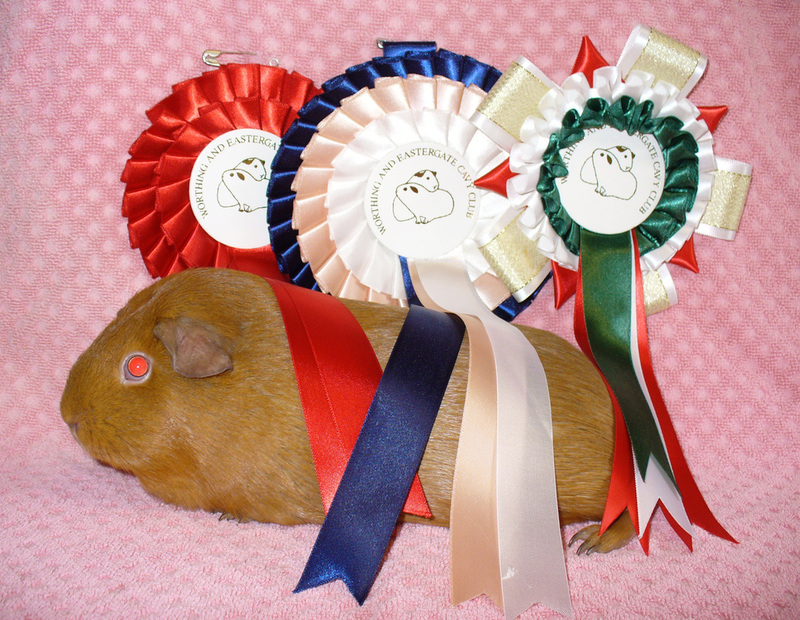 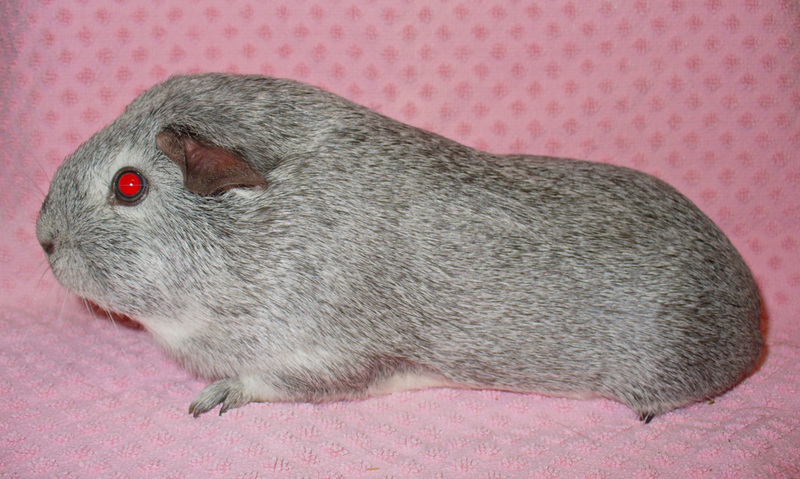 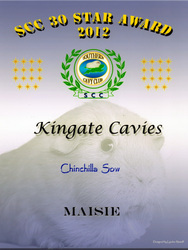 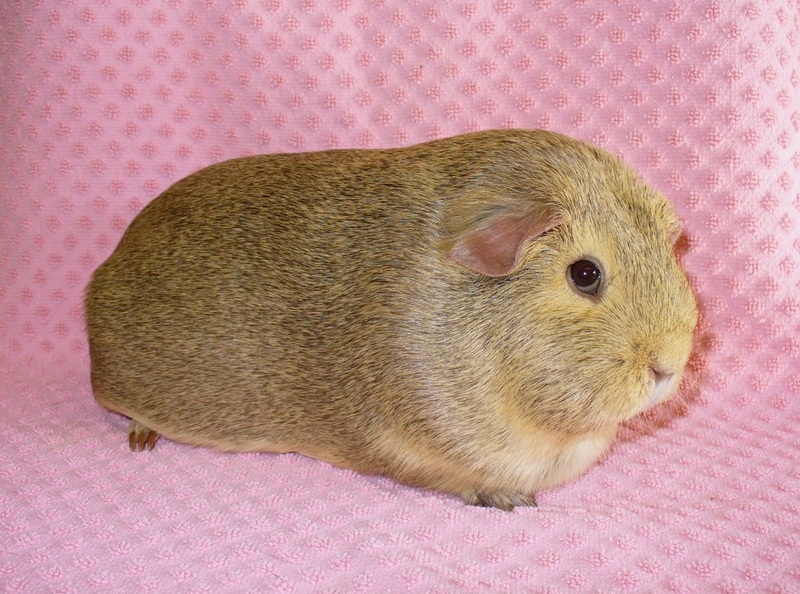 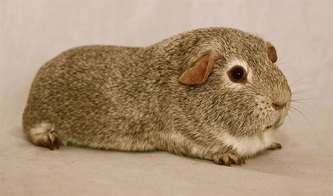 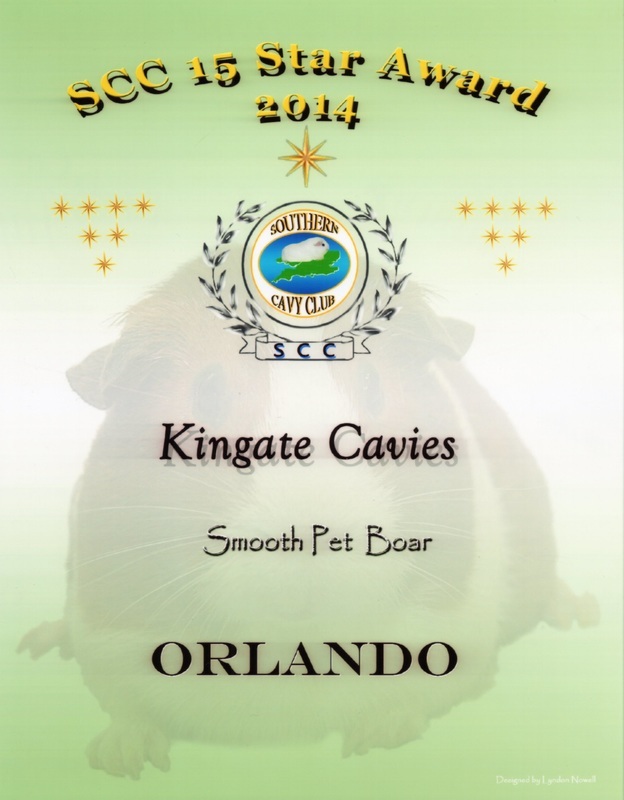 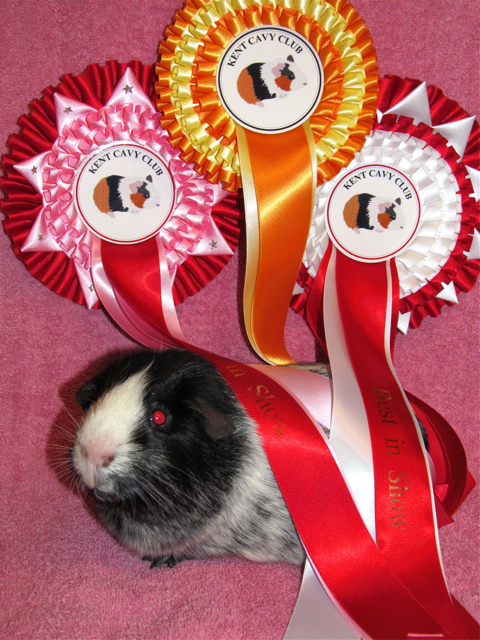 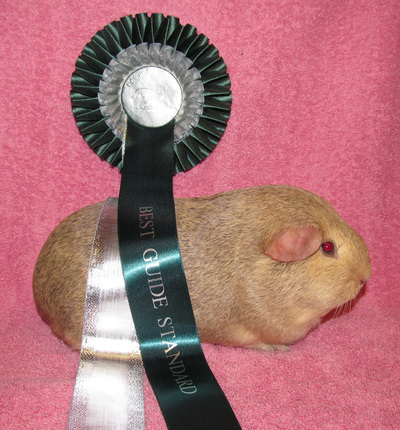 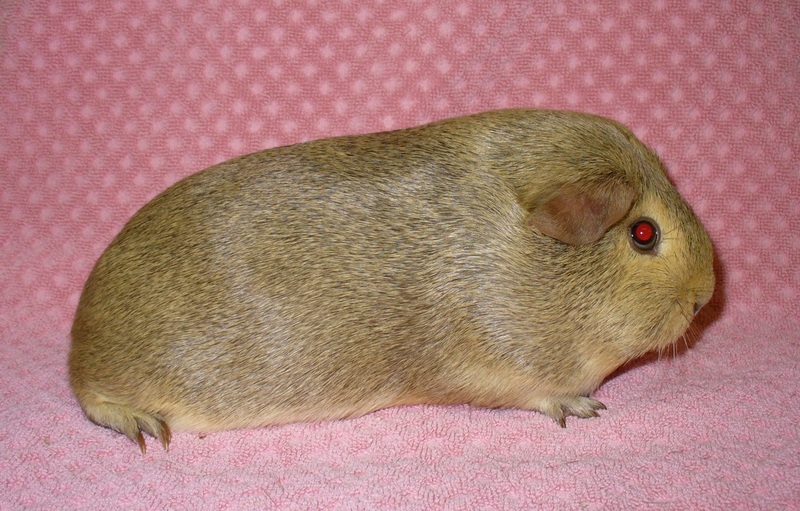 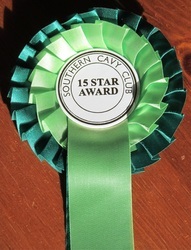 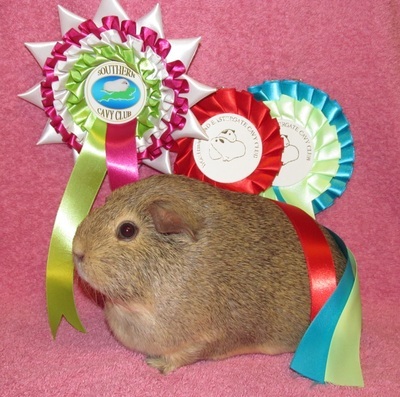 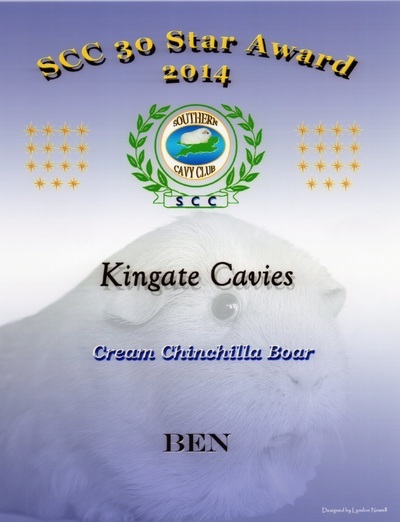 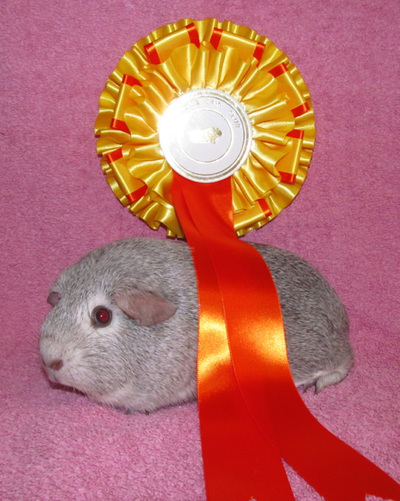 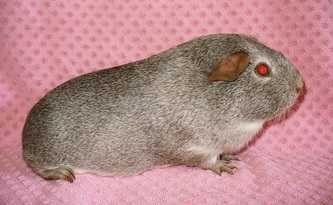 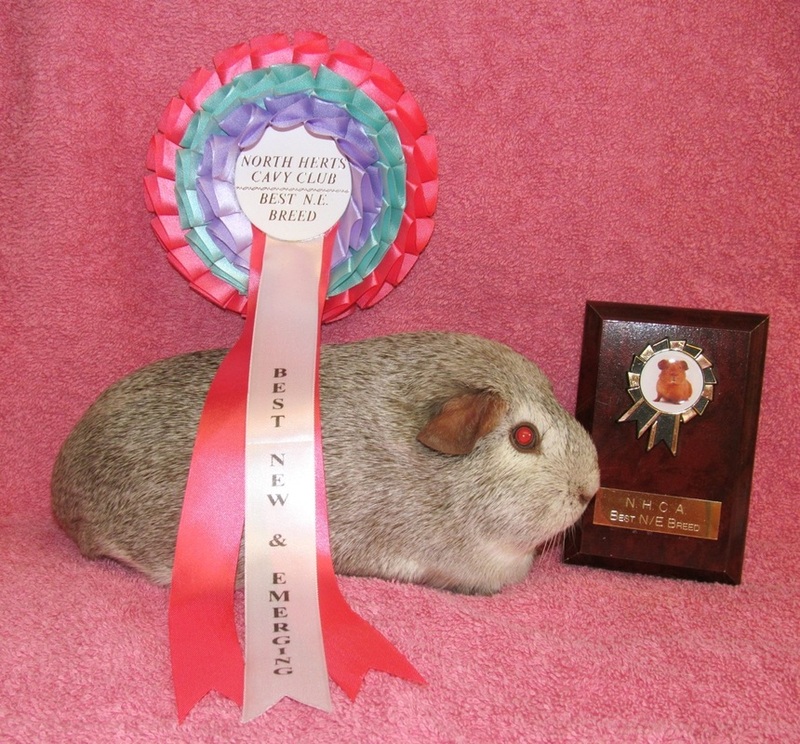 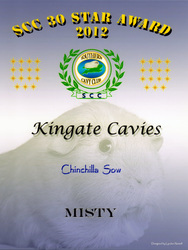 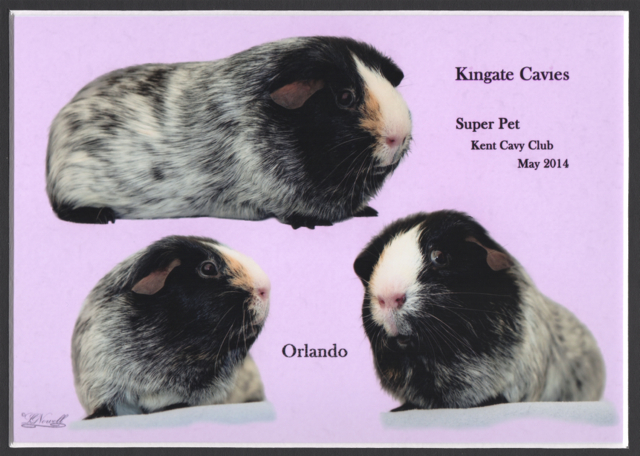 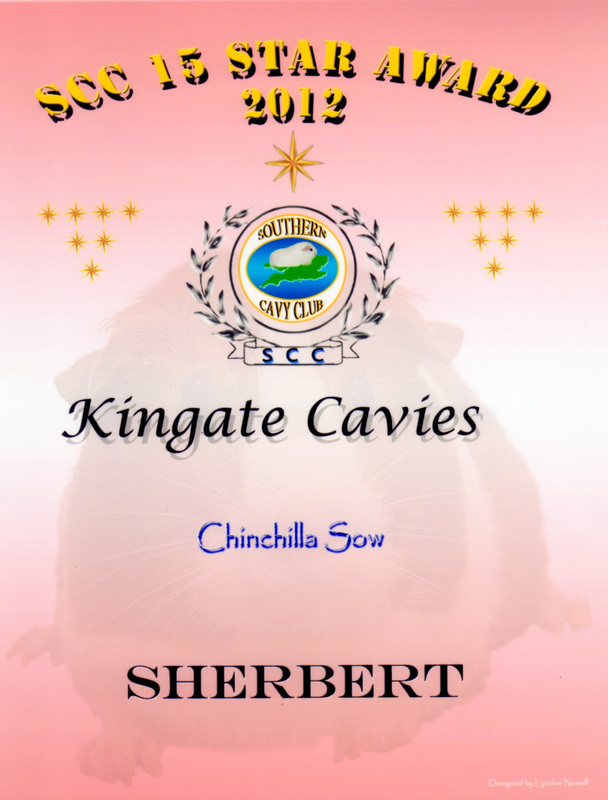 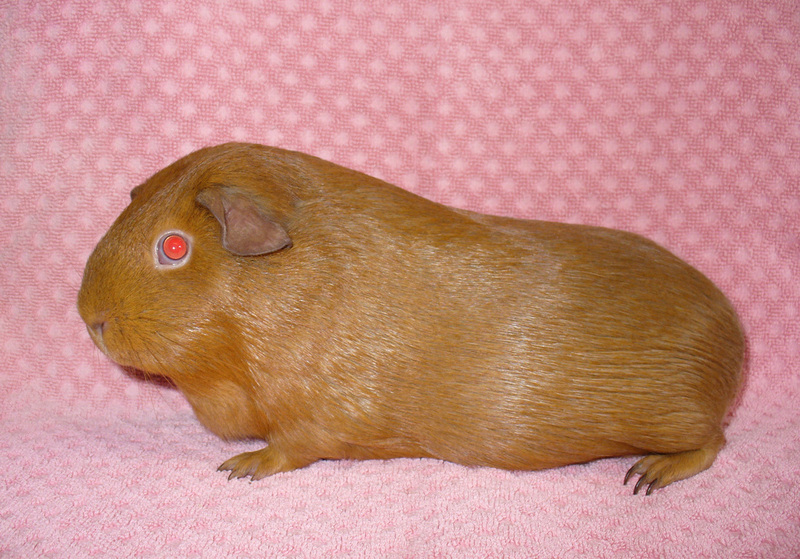 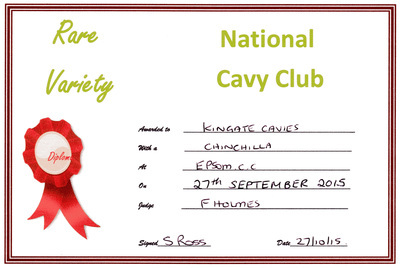 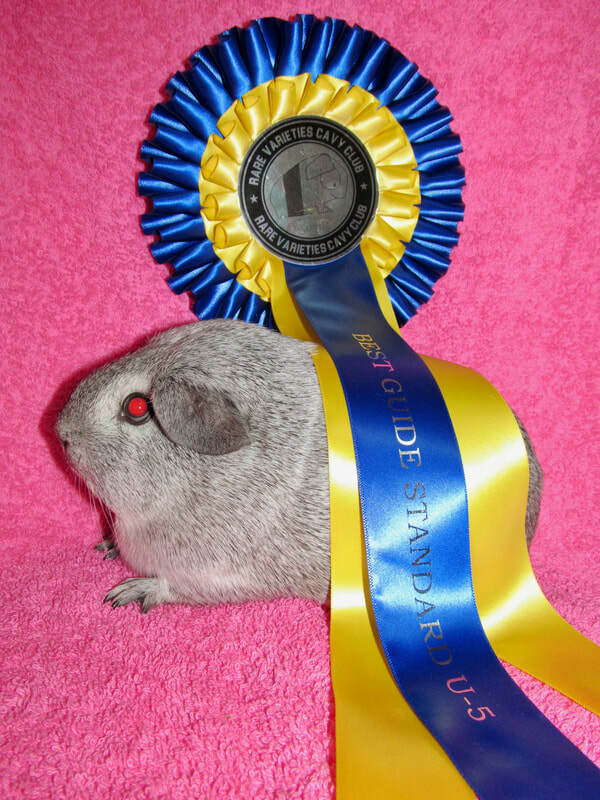 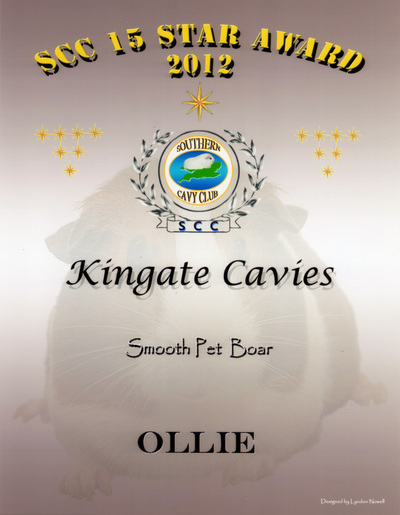 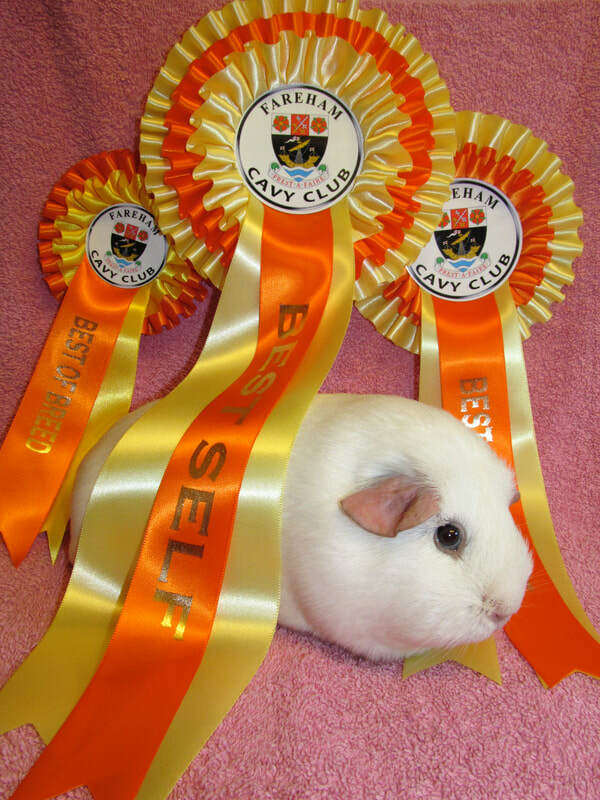 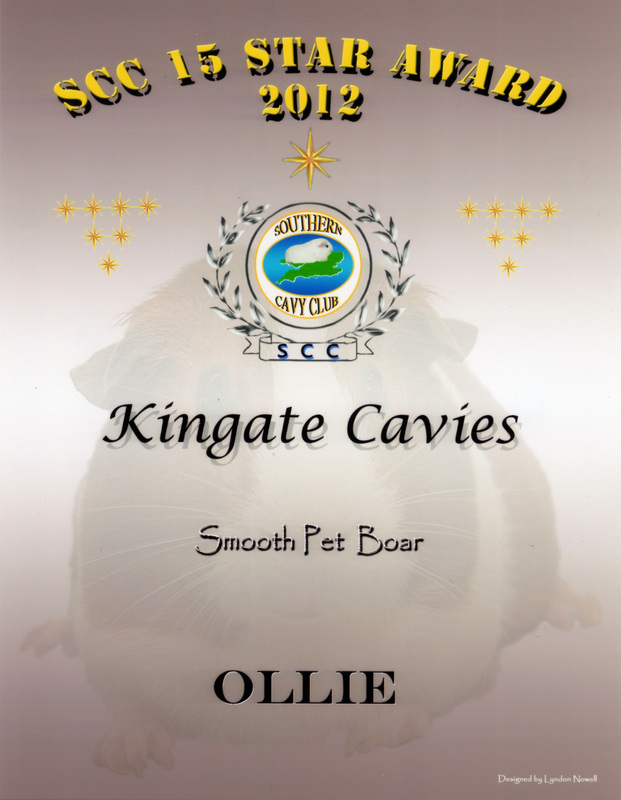 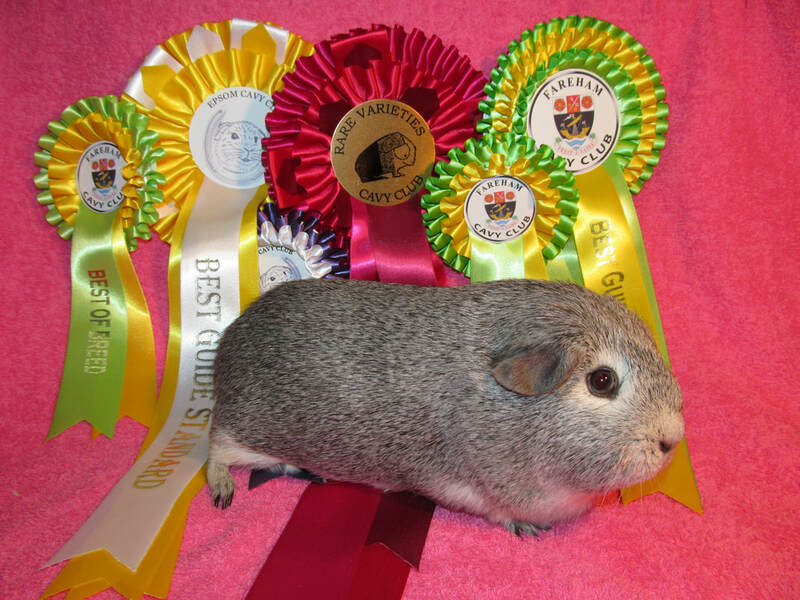 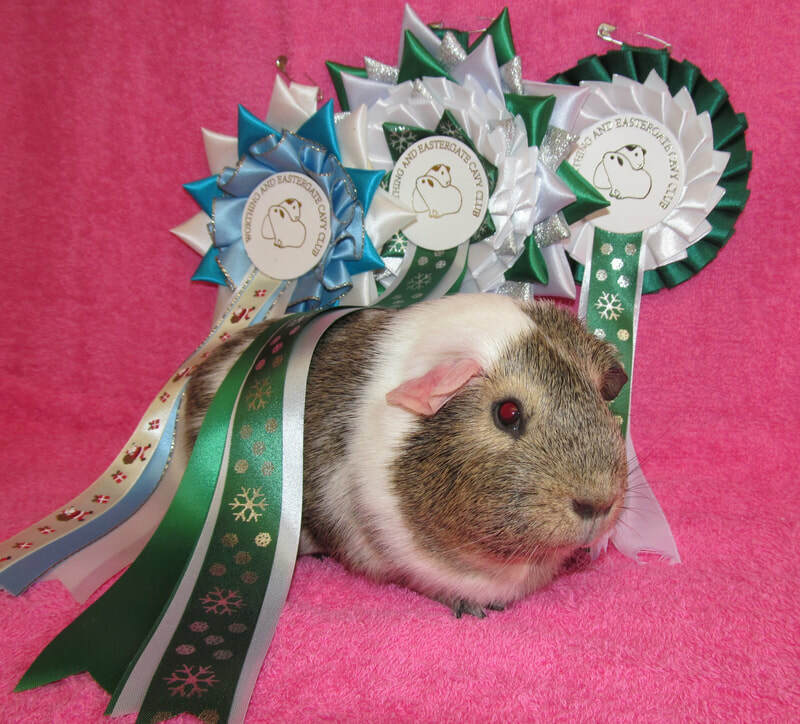 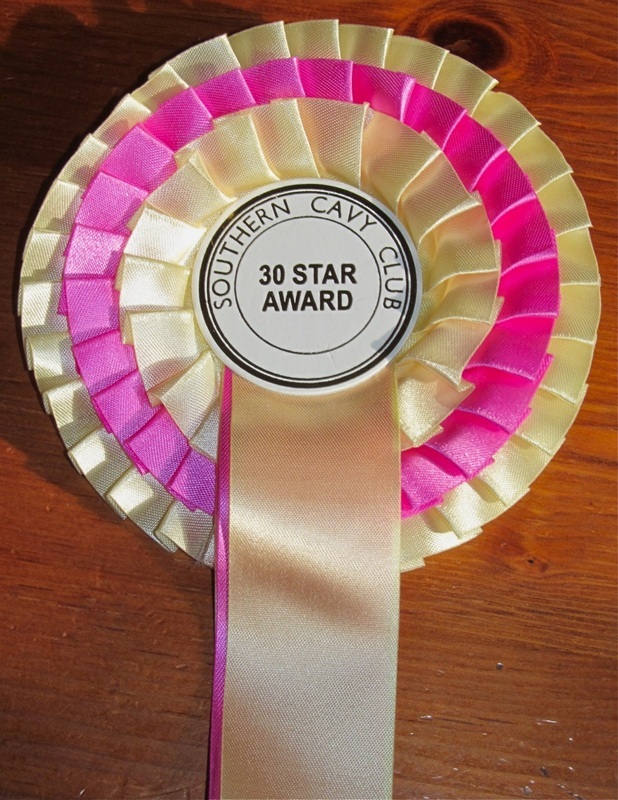 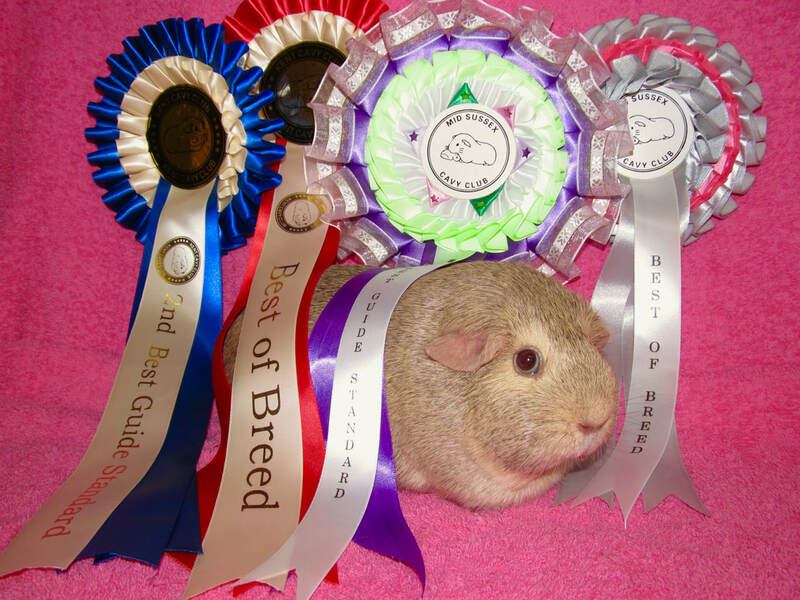 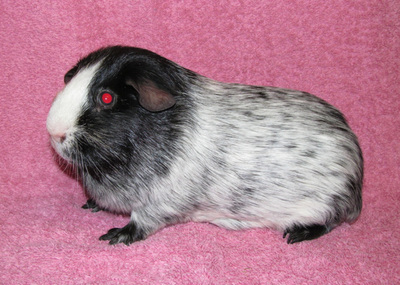 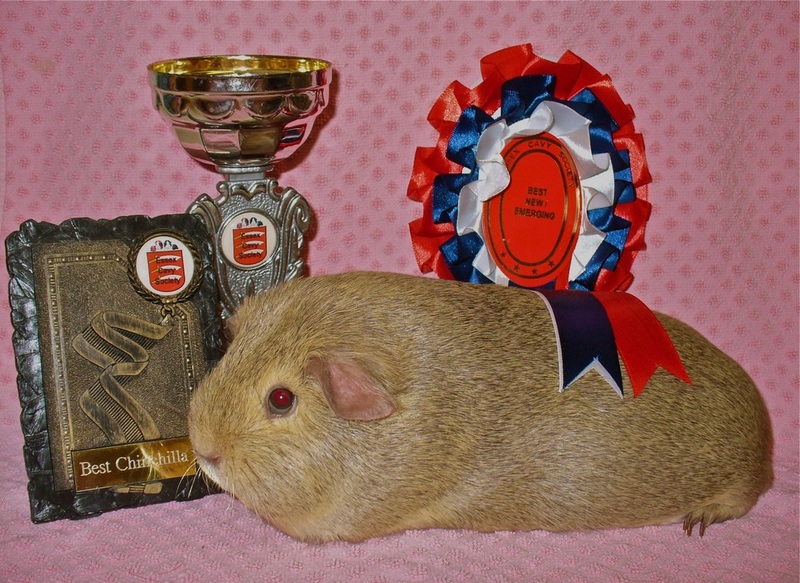 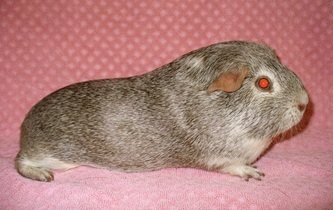 I also won the most Chinchilla Points for the Rare Varieties Cavy Club shows for 2014. 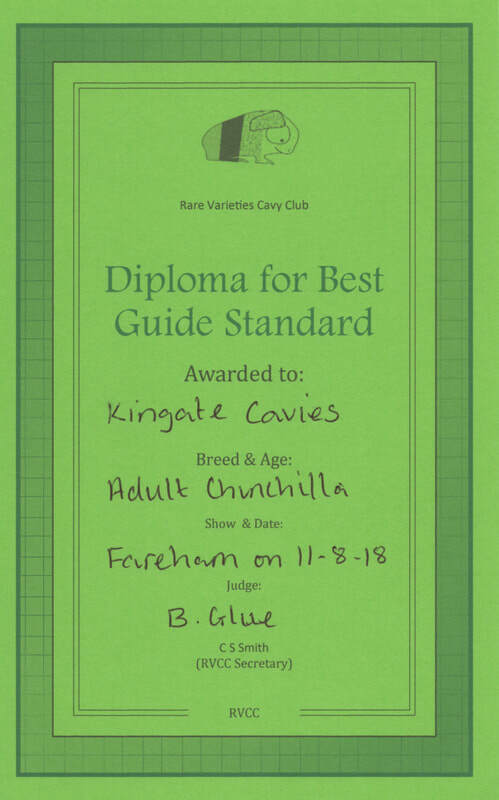 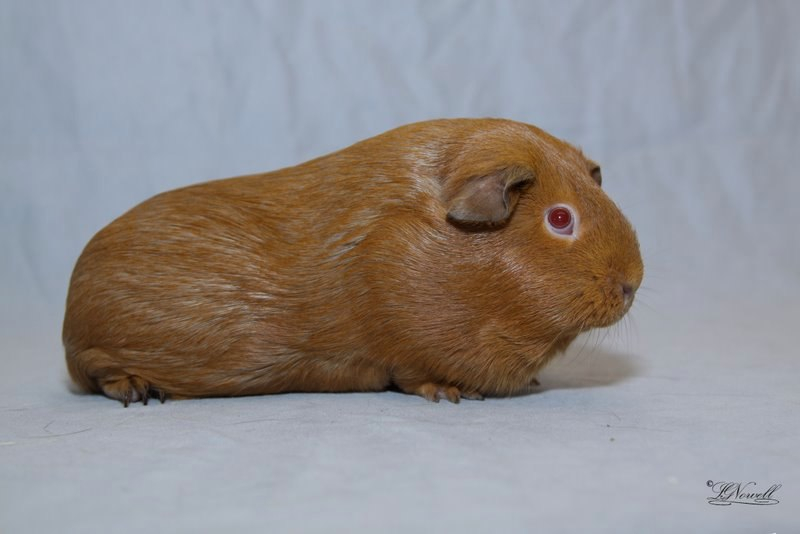 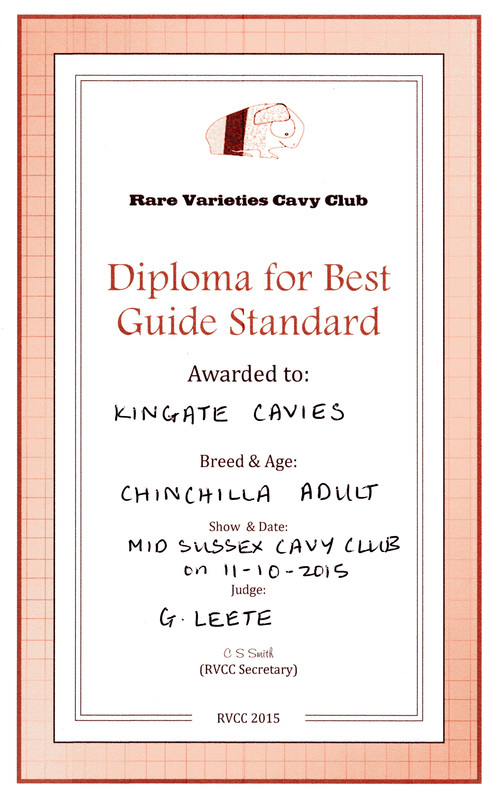 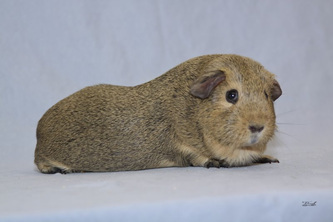 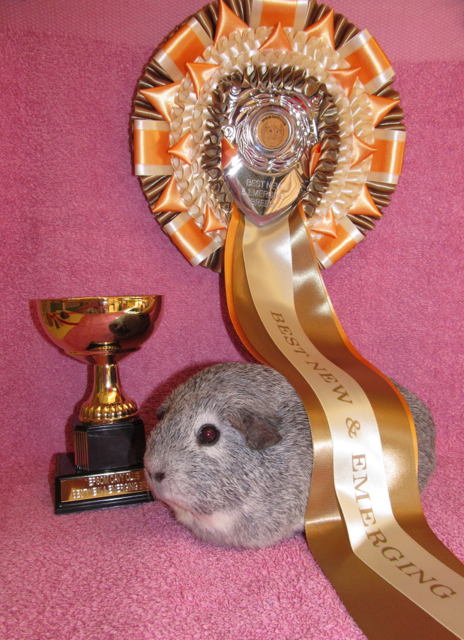 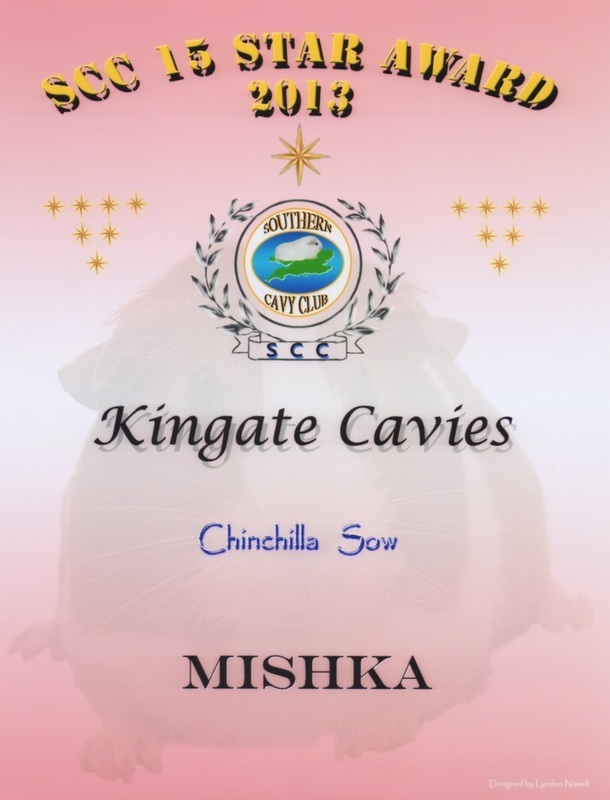 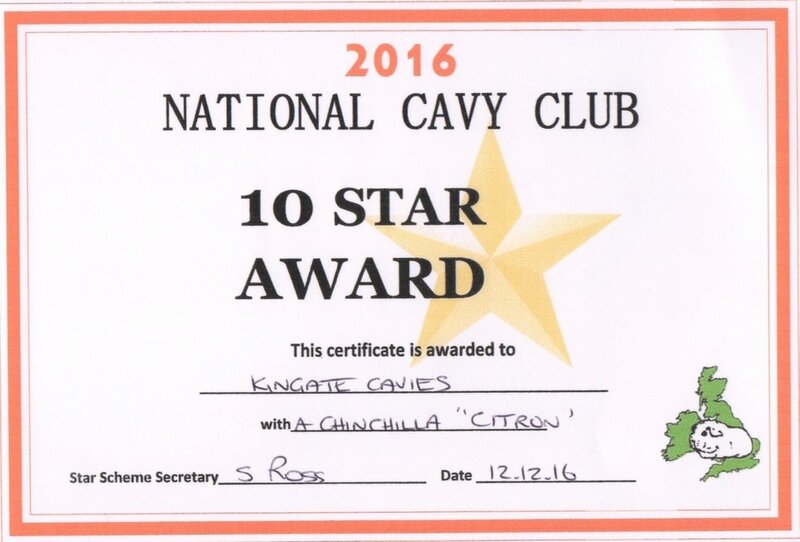 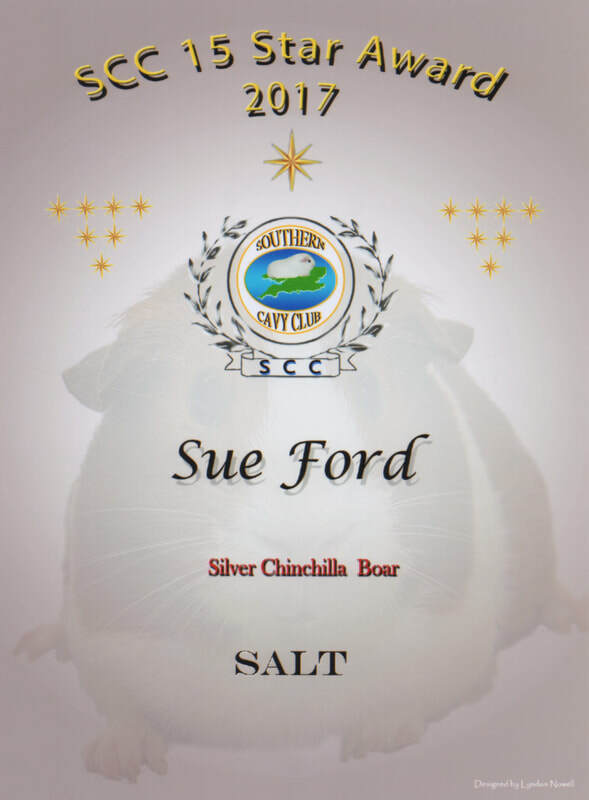 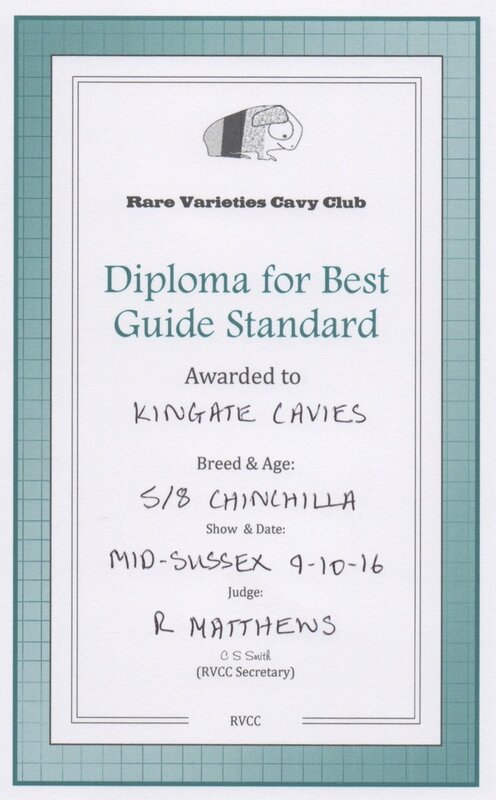 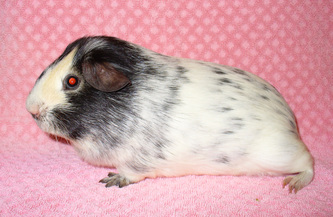 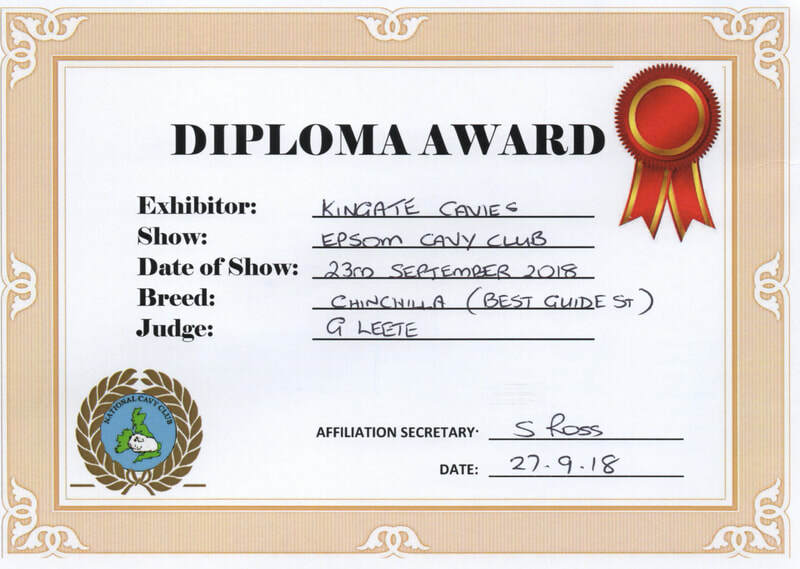 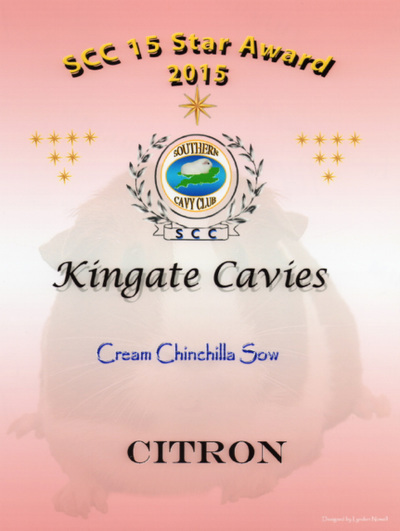 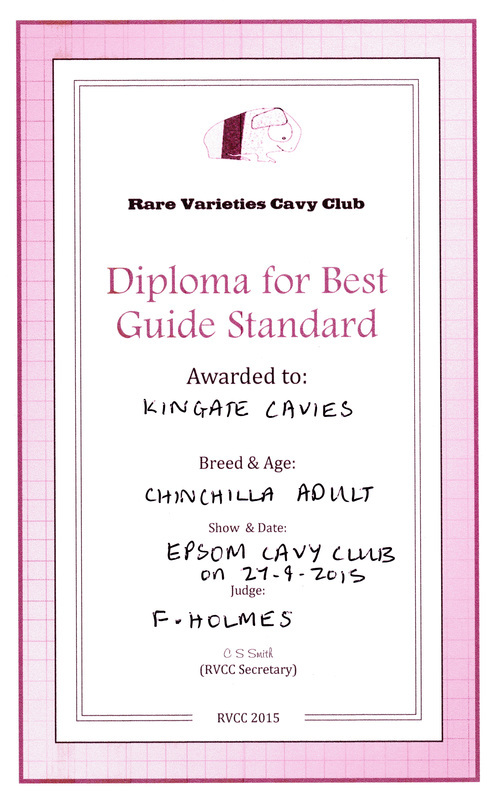 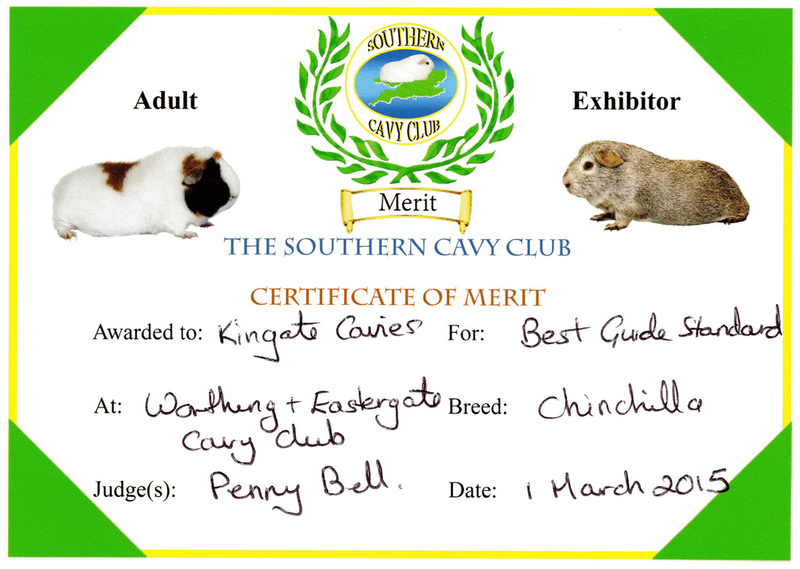 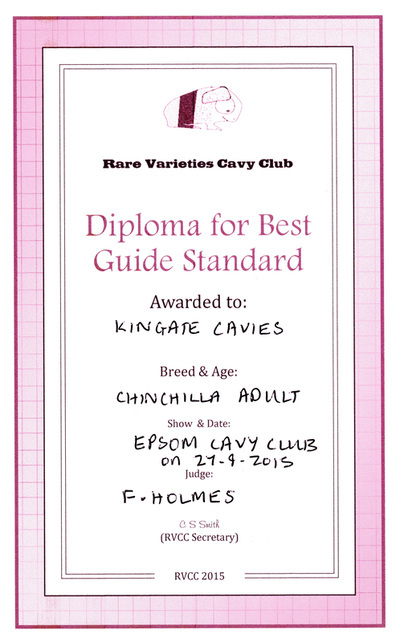 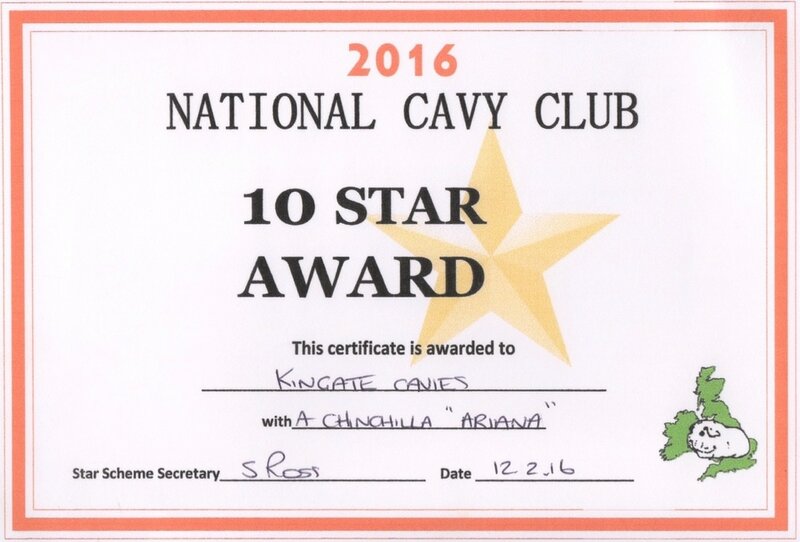 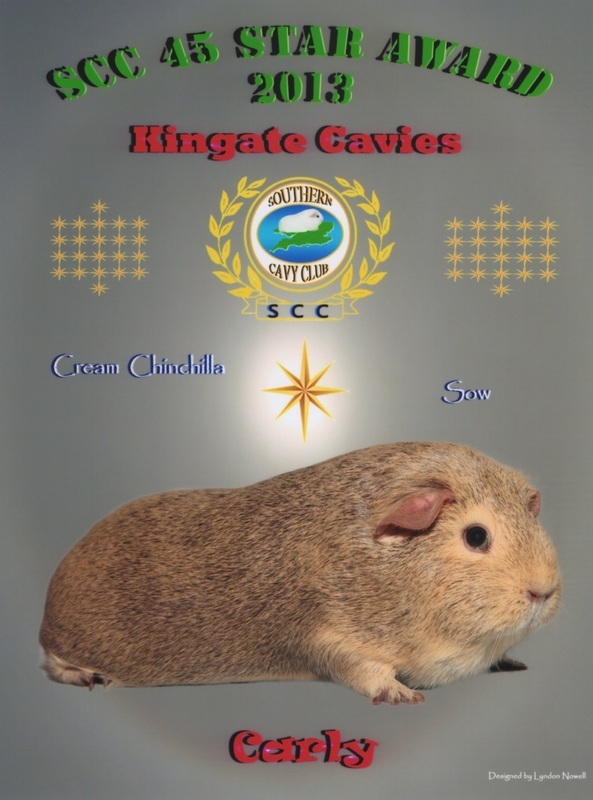 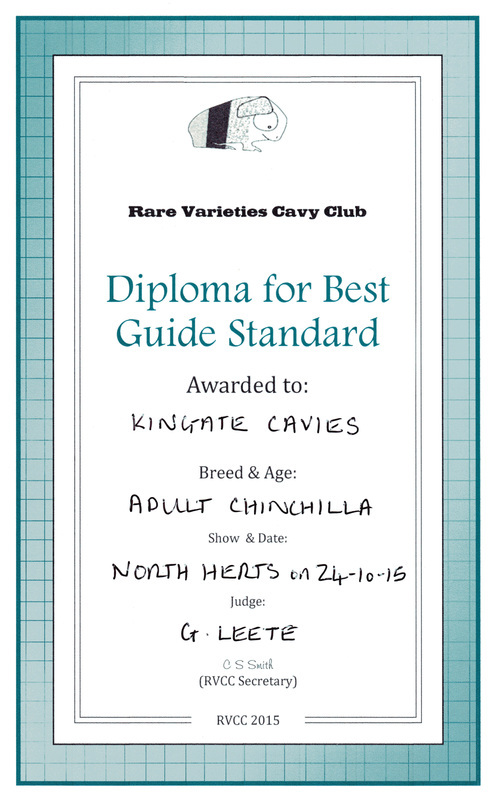 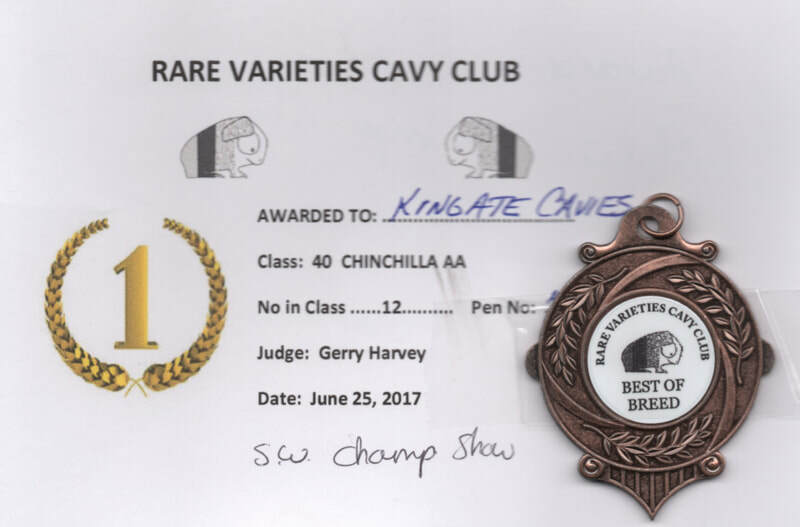 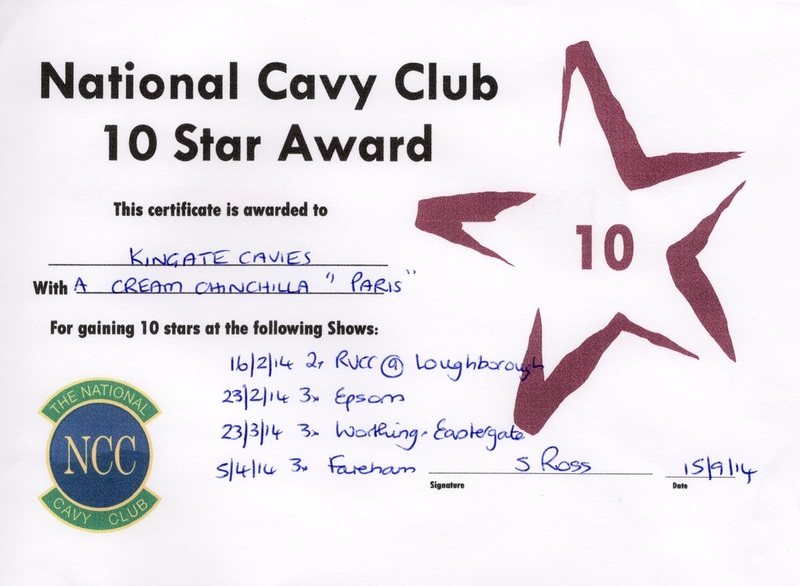 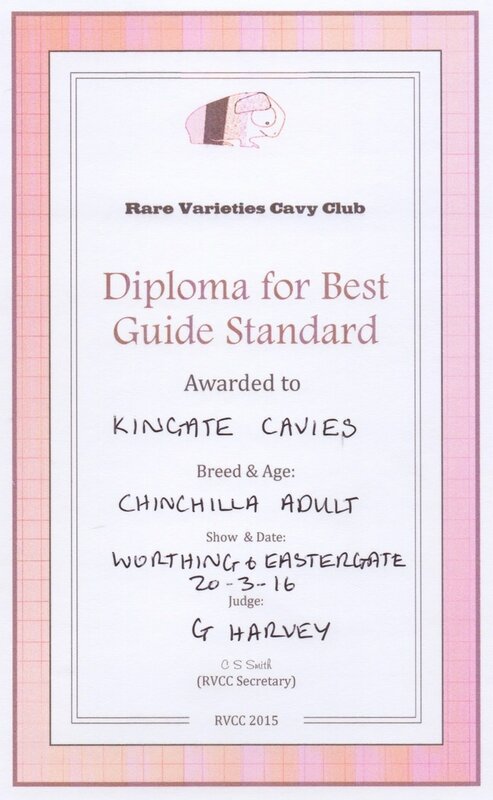 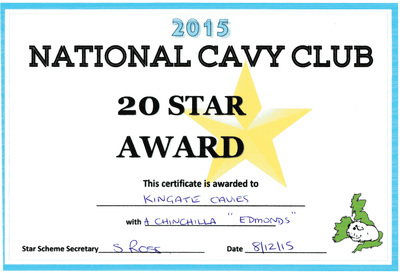 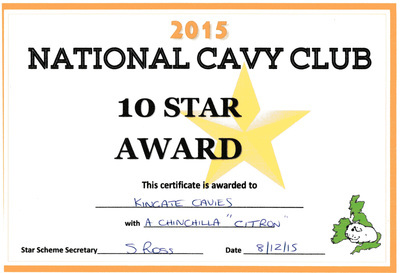 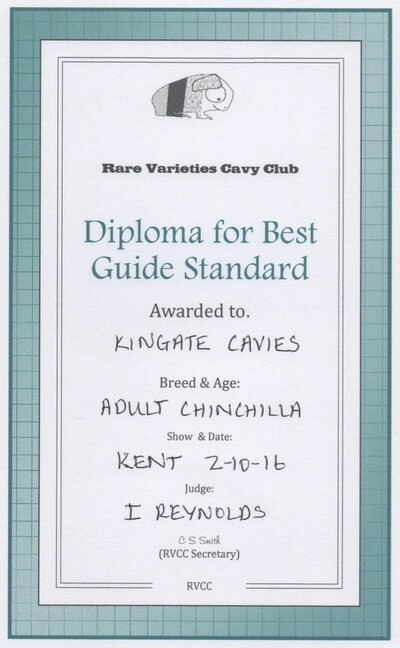 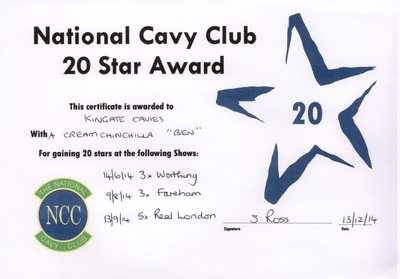 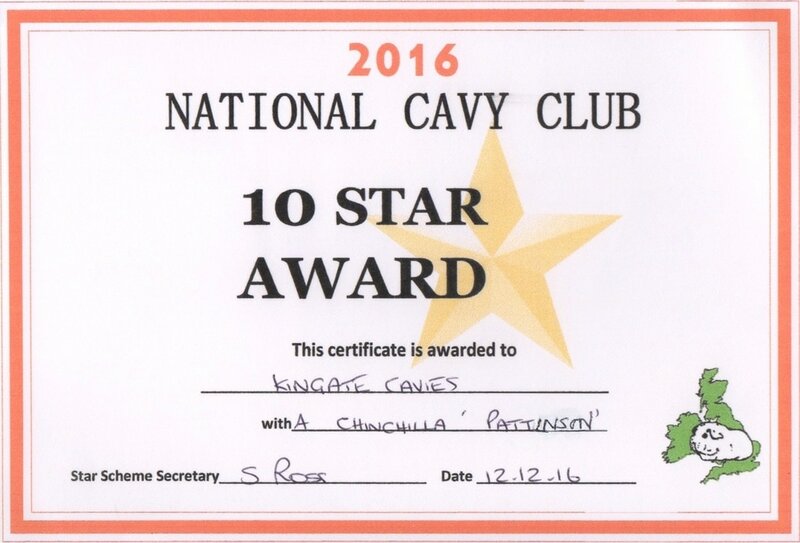 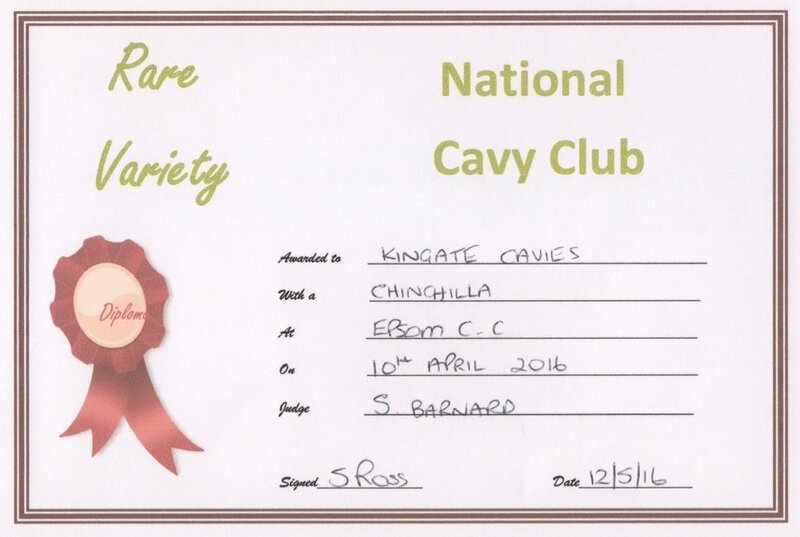 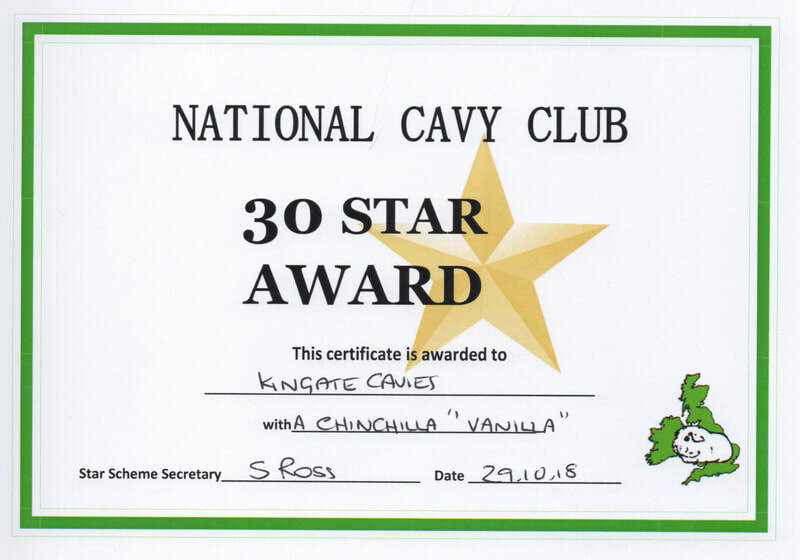 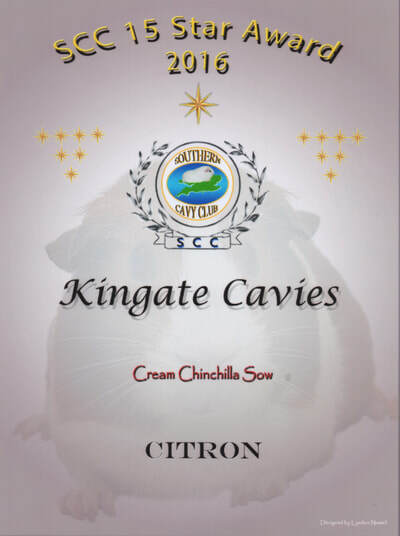 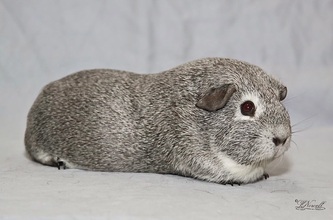 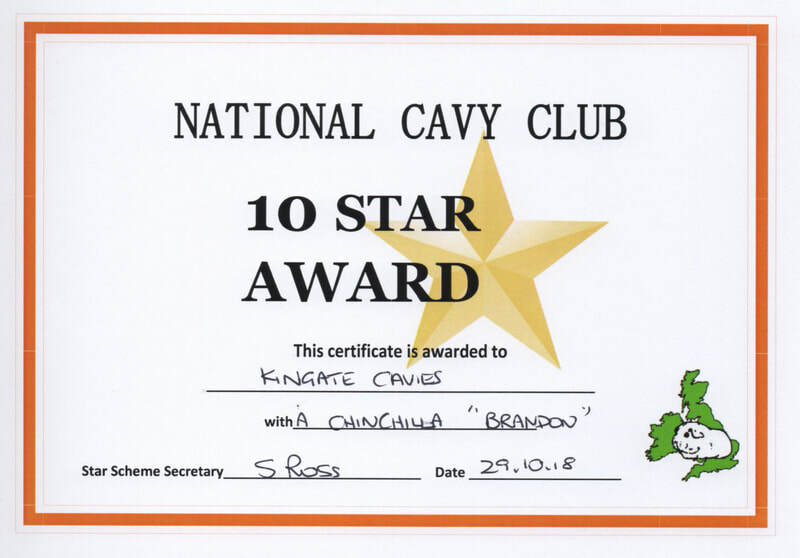 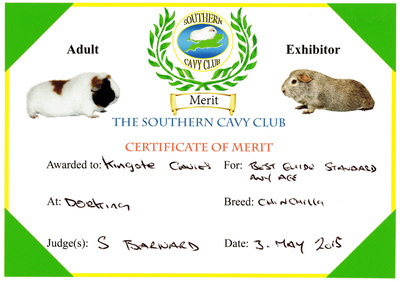 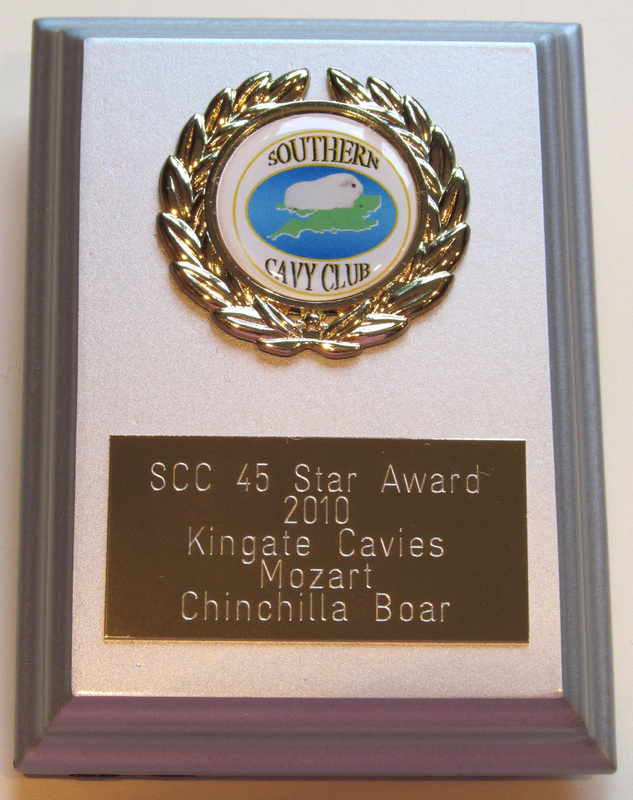 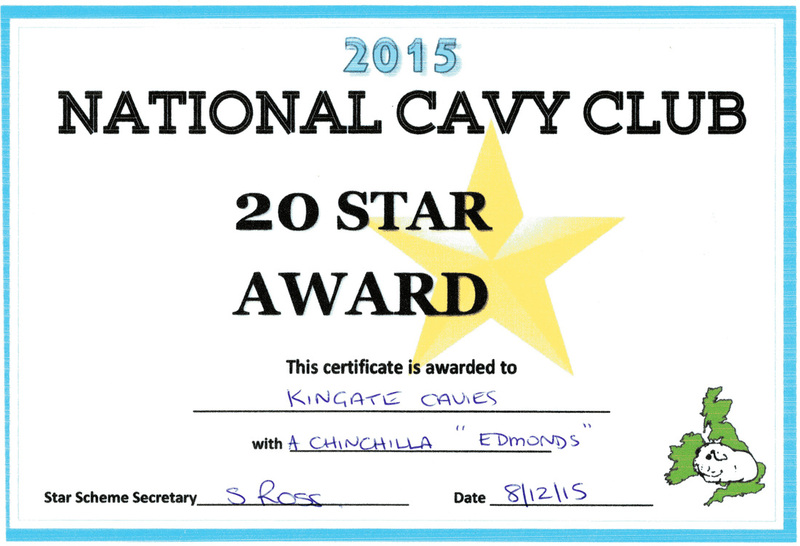 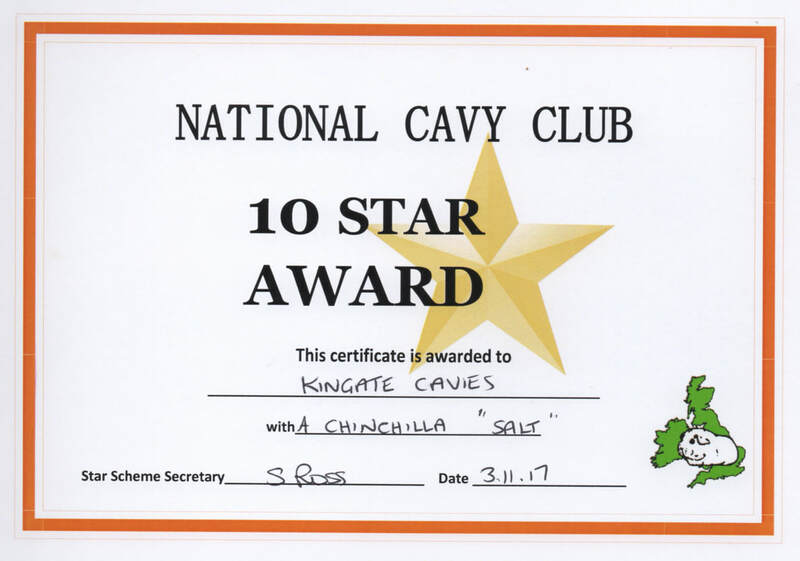 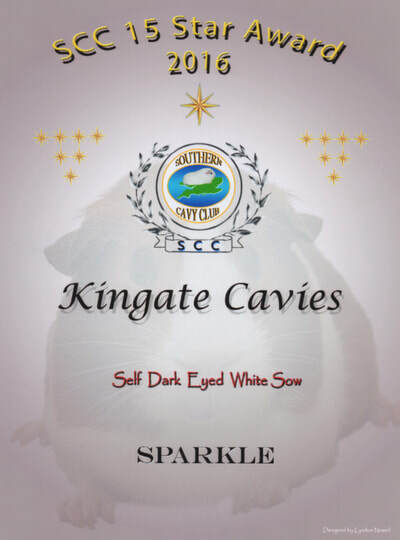 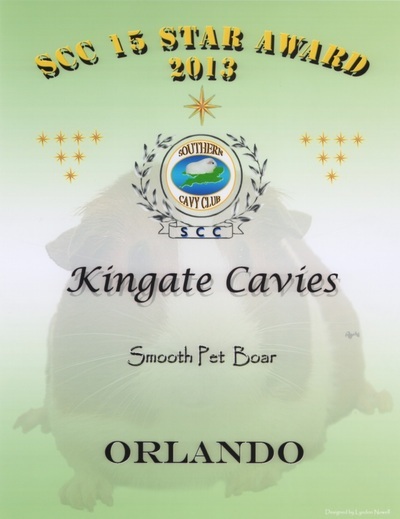 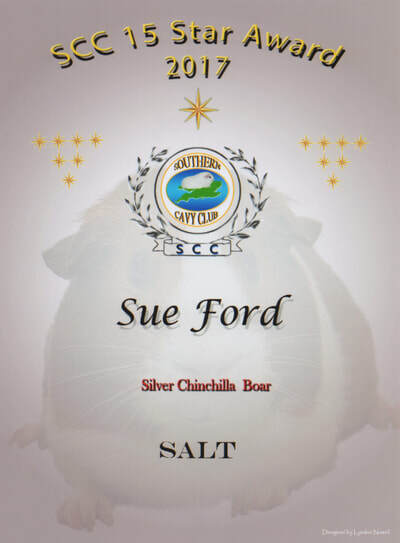 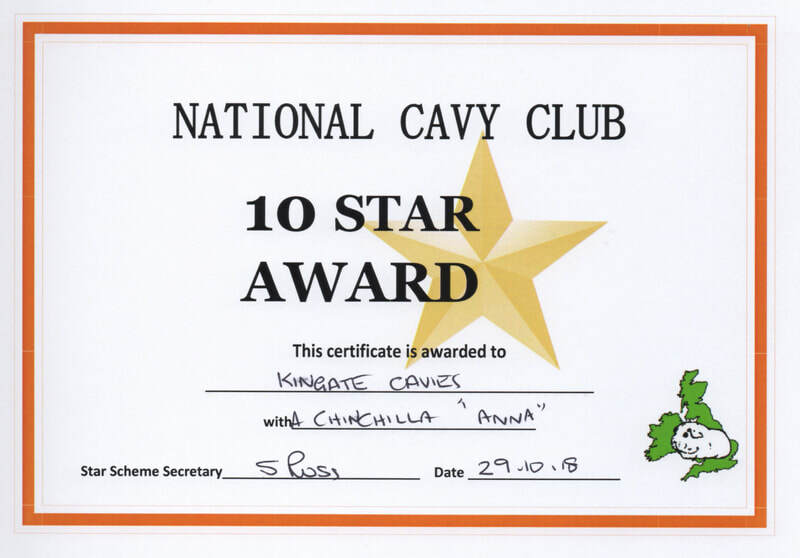 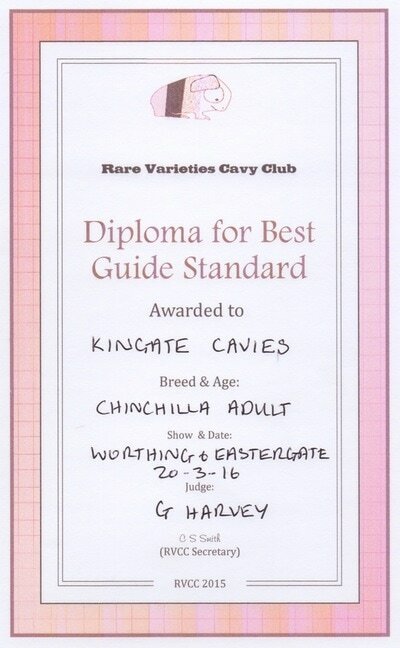 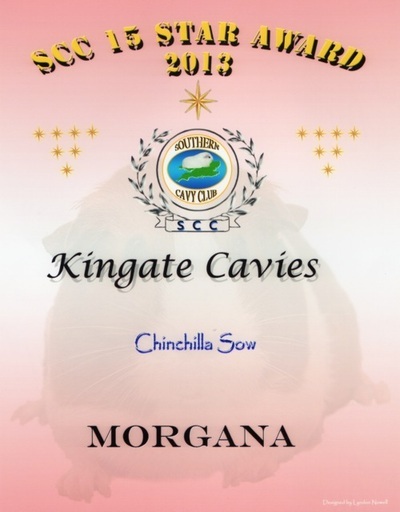 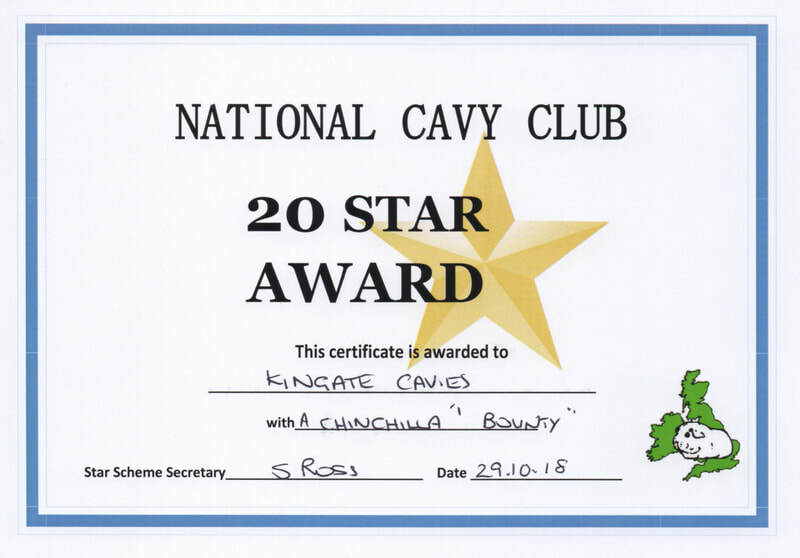 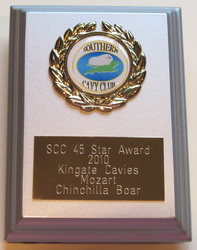 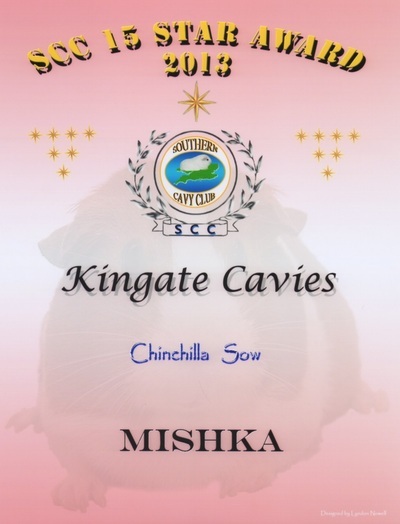 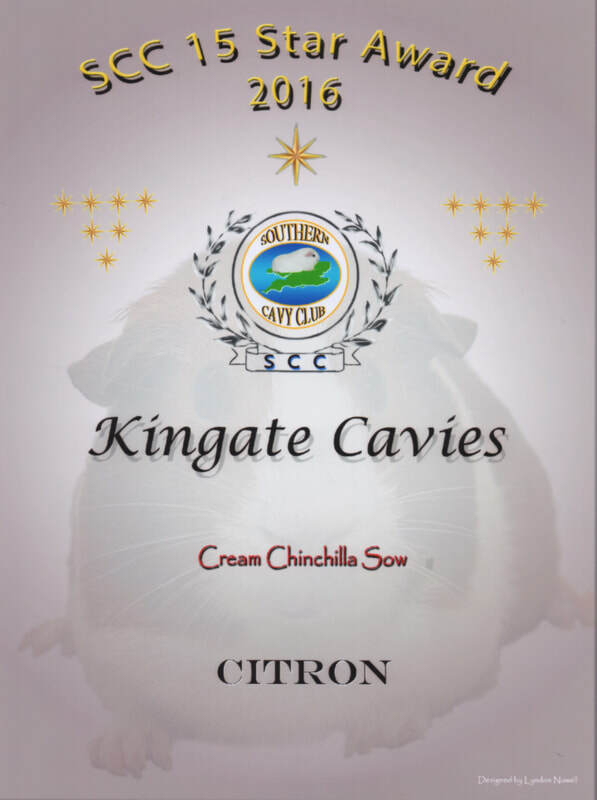 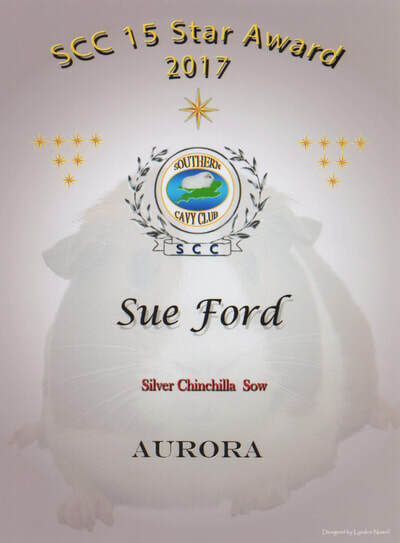 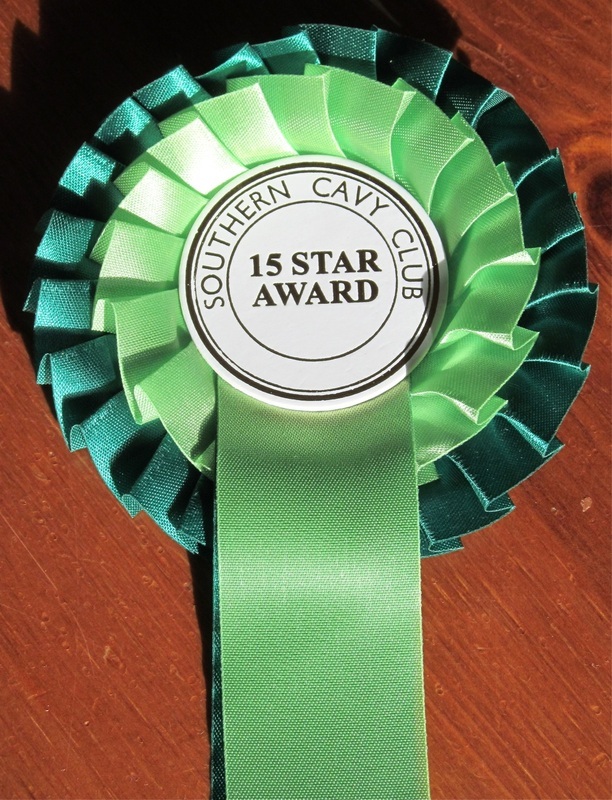 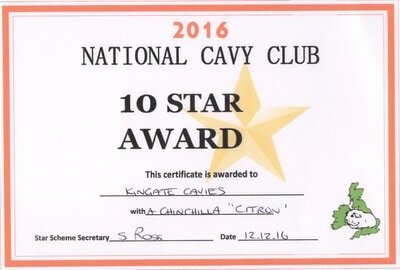 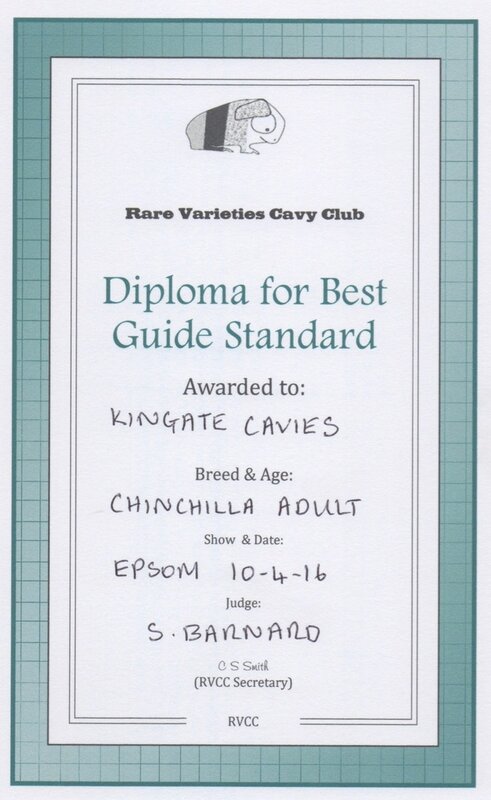 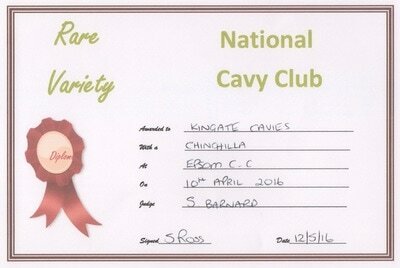 I also won the most Chinchilla Points for the Rare Varieties Cavy Club shows for 2015. A stand and ballpoint pen. Most of these merit cards are for Best Guide Standard, but Sparkle won 1 BIS and 2 Best Self. 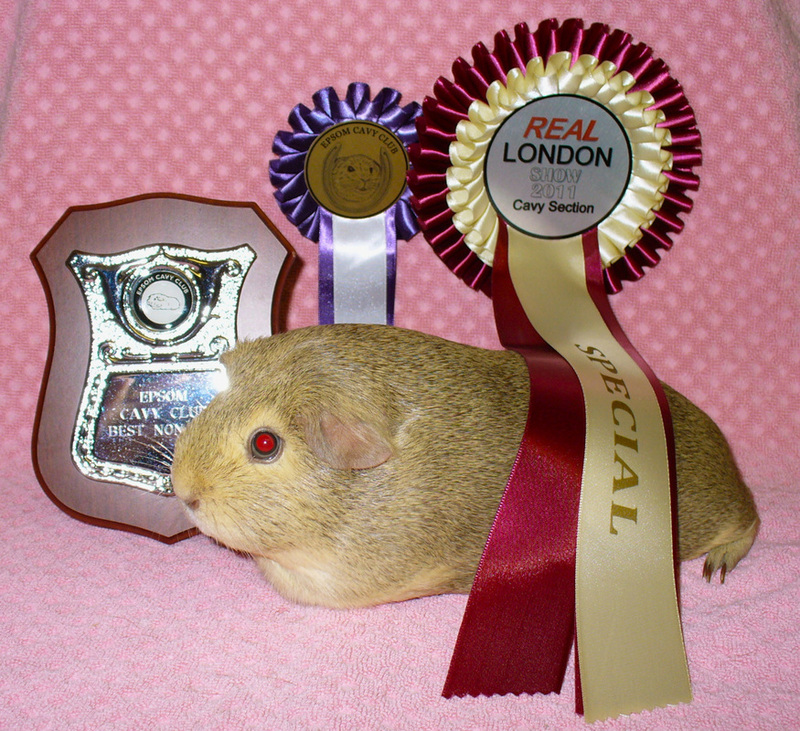 Cocoa won 1 Best Pet. Aurora - 20 SCC Stars, 2 SCC Merit Cards, 19 NCC Stars, 2 NCC Diplomas, 1 RVCC Best of Breed Medal. 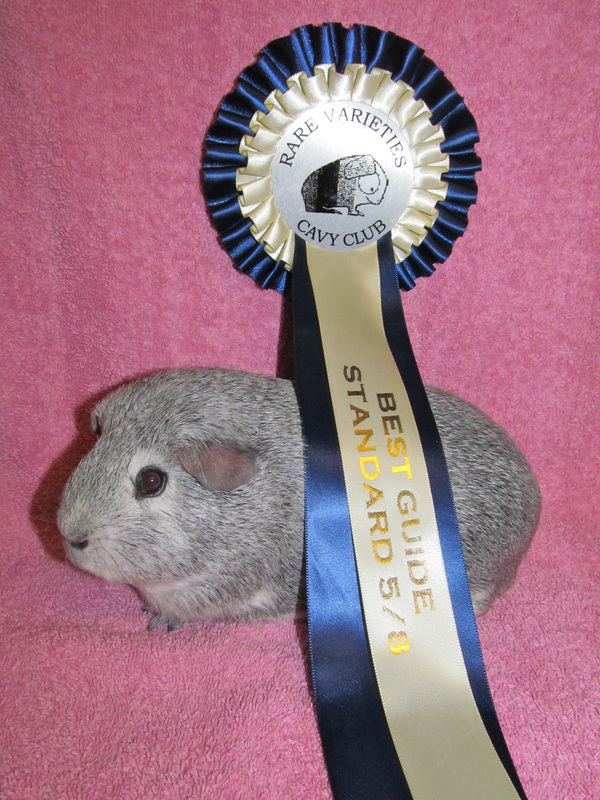 Also she had Best Guide Standard at the RVCC stock show at SW Champ show out of 60!!! 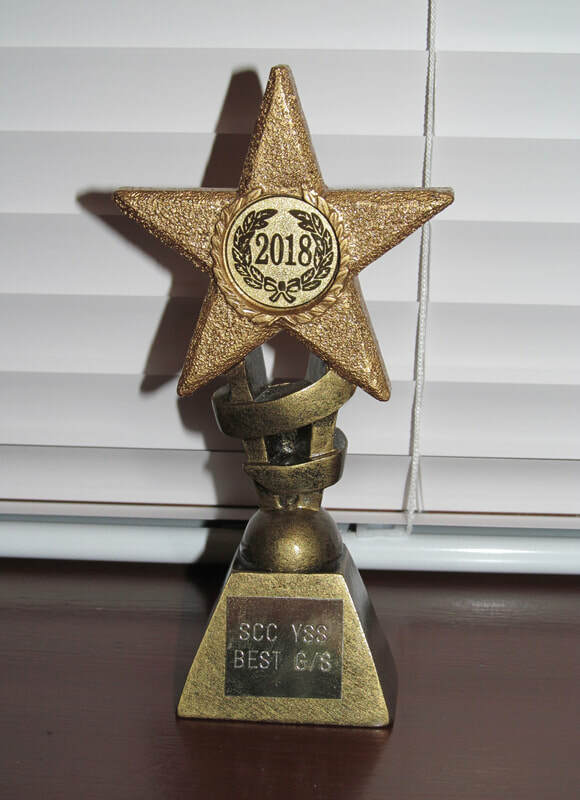 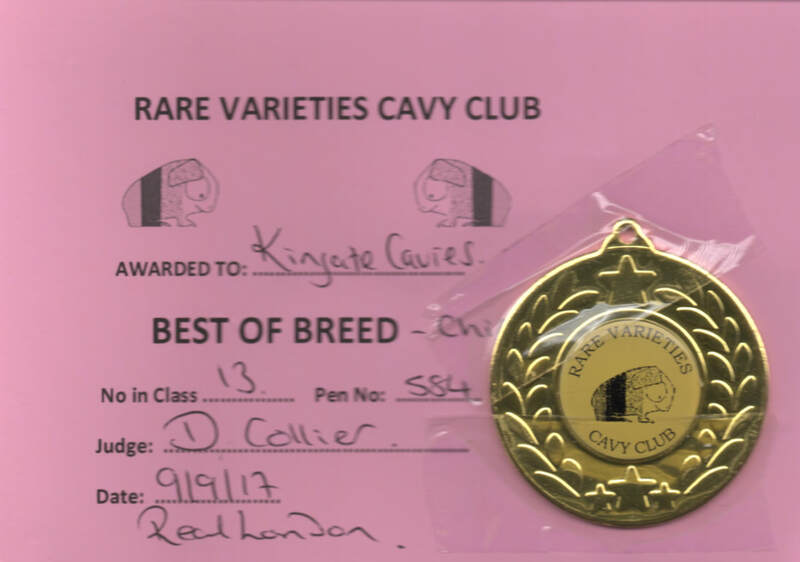 Vanilla - 6 SCC Stars, 1 RVCC Best of Breed Medal at RVCC Stock at Real London! Truffle - 4 SCC Stars, 1 SCC Merti Card, 1 NCC Diploma for Best New & Emerging at his first show! I also won the most Chinchilla Points at the RVCC for 2017 and won a lovely prize! 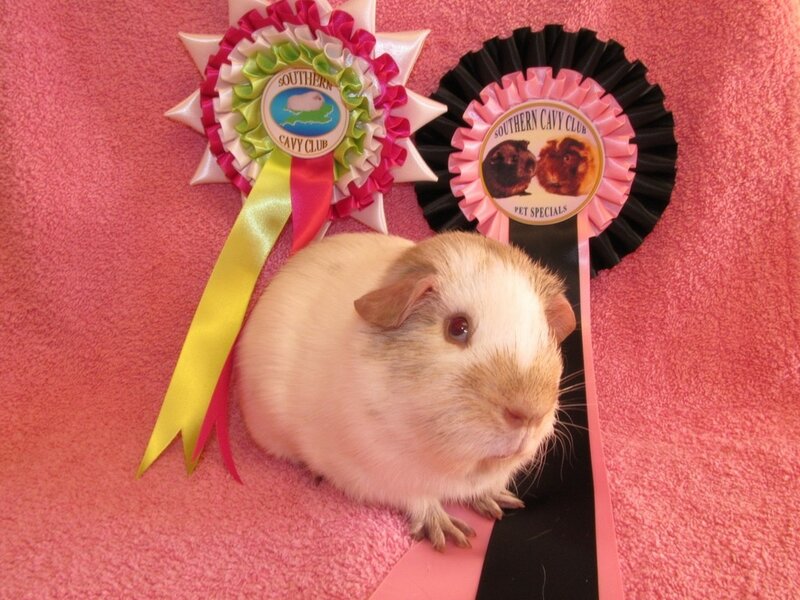 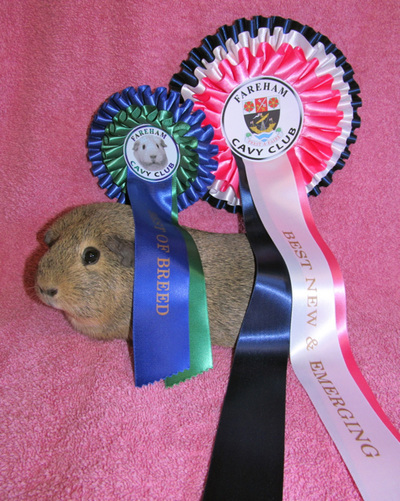 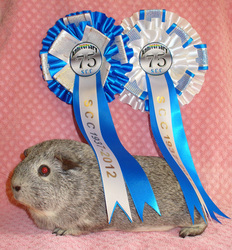 Grace - 1 SCC Merit Card, Best Pet and Super Pet at only her 2nd Show! 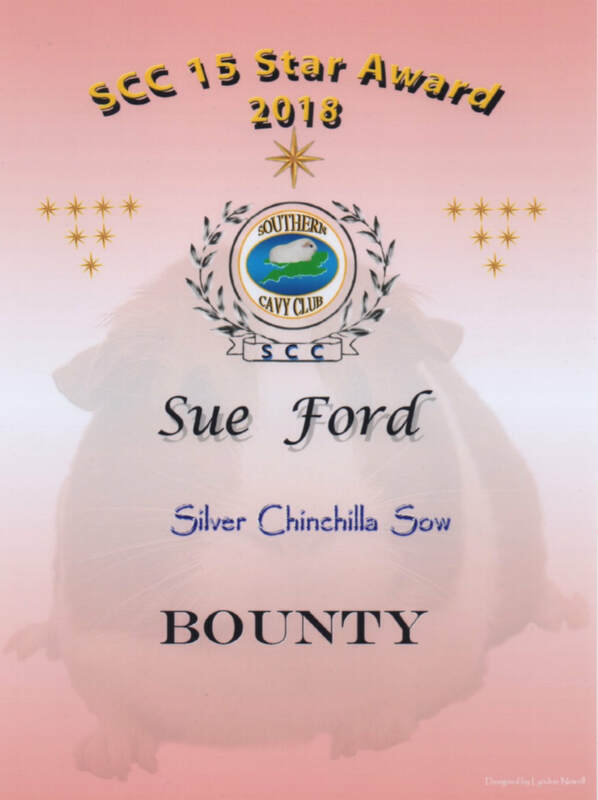 I also won the most Chinchilla Points at the RVCC for 2018.